This is one of the four galleries that The Peggy Lee Bio-Discography dedicates to the presentation of various-artists compilations from the Capitol-Emi family of labels. 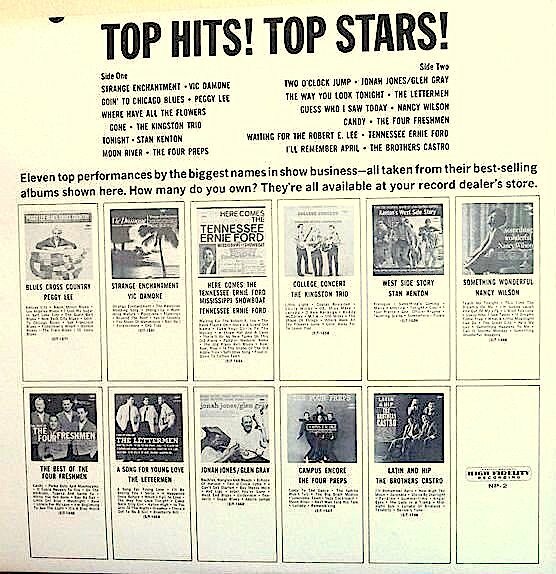 Two specific types of compilations are targeted in the present page: Capitol's self-celebratory retrospectives (discussed in section I) and the label's promotional samplers (discussed in the other sections). Naturally, only samplers and retrospectives with Peggy Lee tracks qualified for inclusion. Note, however, that this gallery remains a work in progress: due to lack of images and information, many more qualifying items (some of them listed at the very bottom of the page) are yet to be incorporated. I should also point out that, per my policy about various-artists compilations, the items listed on this page have not been incorporated to the main body of this work (the Peggy Lee sessionography). 1 & 2. 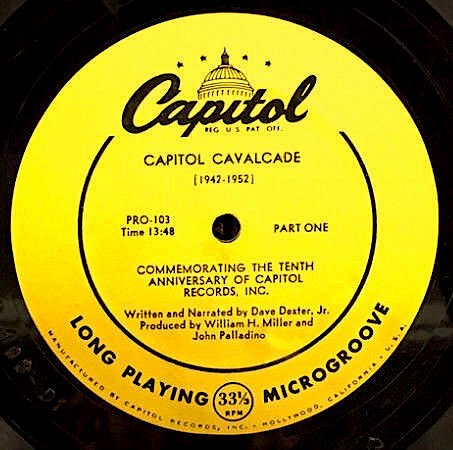 Title: Capitol Cavalcade (1942-1952) / Format: 10" LP / Label: Capitol / Release Year: 1952 / Cat. Num. 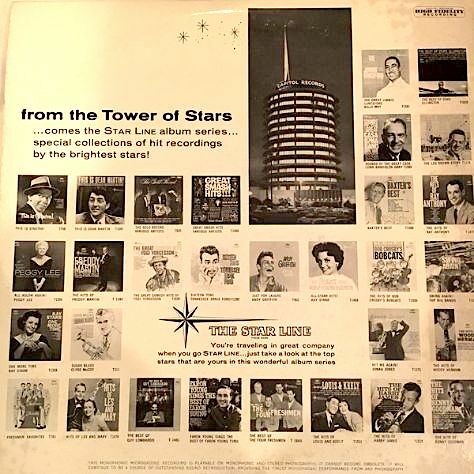 : Pro 103 & Pro 104 / Note: Promotional disc "commemorating the tenth anniversary of Capitol Records, Inc." Produced by William H. Miller and John Palladino. It is a narrated history of Capitol's foundation and success, focusing on its hit singles. Dave Dexter, Jr. served as writer and narrator. Glenn Wallichs also supplies a small chunk of the narration. Probably meant for radio airplay. It was indeed played by WJZ-ABC disc jockey Vince Williams on March 27, 1952, during his regular run at the station (11:00 p.m. to midnight). 3-5. 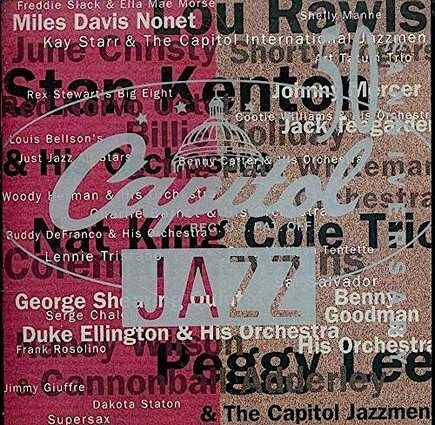 Title: The Capitol Record / Format: EP / Label: Capitol / Release Year: 1956 / Cat. Num. 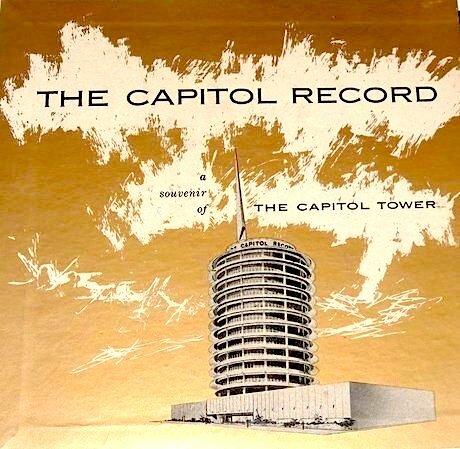 : Pro 254 & Pro 255 / Note: This extended-play disc is a souvenir that celebrates the opening of the Capitol Tower, and which is said to have been pressed exclusively for distribution among the guests at the building's dedication ceremony (April 22, 1956). 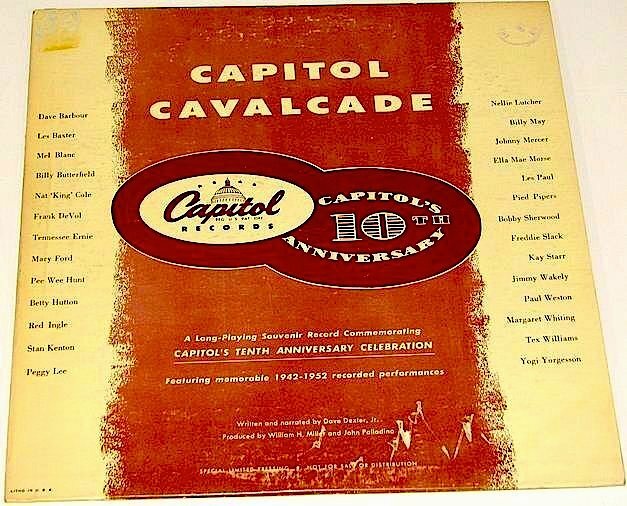 It offers a history of Capitol through its hits records, with narration by George Fenneman. Only short clips of each hit are heard. I do not know which Peggy Lee performance is heard in it; "Mañana" is the strongest candidate. 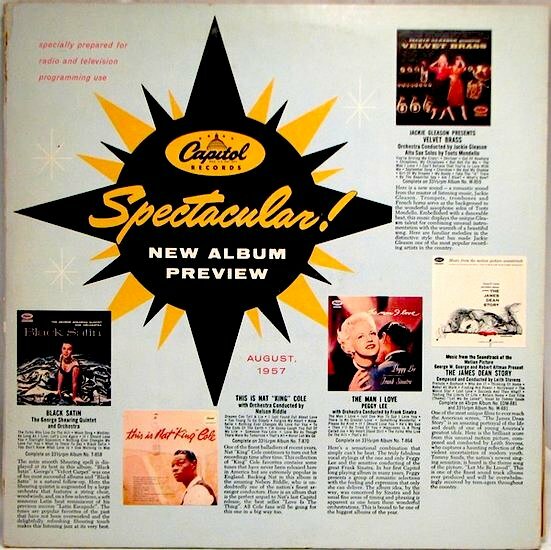 Left out of the pictorial gallery above, the back cover includes a photo of what Capitol promoted as the debut session, with Frank Sinatra serving as the conductor (first of the Tone Poems Of Color dates, February 22, 1956). A second photo spotlights Glenn Wallichs and Alan Livingston, who at the time held the titles of president and executive vice president of Capitol Records. 6-8. 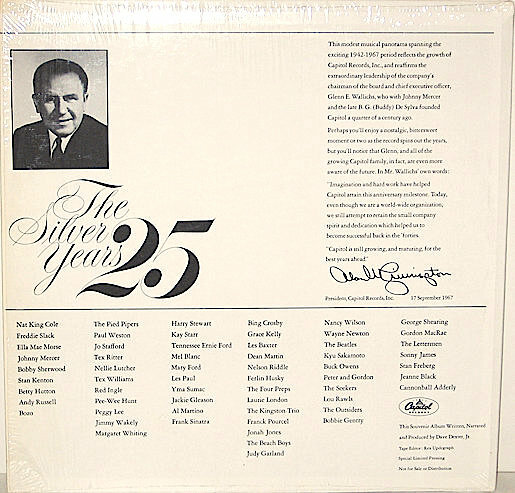 Title: The Silver Years; Commemorating Capitol's Twenty-Five Years In The Record Industry / Format: LP / Label: Capitol / Cat. Num. : Snp 91017 / Rel. Year: 1967 / Note: Includes Peggy Lee's Capitol recording of "Fever." In the album's back cover (image #7), we can see a photo of Capitol's then-president Alan Livingston, along with the brief note that he wrote for this issue, which concludes with his signature. Also seen in the back cover is a list of Capitol's mainstay roster, divided into six rows. The artists in the first row seem to be those who joined and gave hits to the label during its first three years. 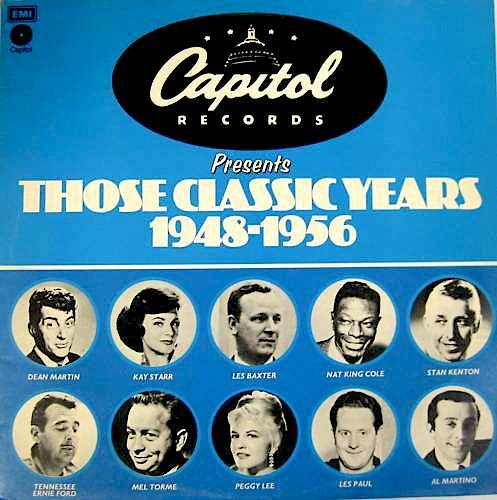 Similarly, those in the second row had their earliest or biggest Capitol hits during the second half of the 1940s, those in the third row during the first half of the 1950s, and so on. Peggy Lee's name shows up in the second row. The vinyl, not pictured above, bears the typical Capitol rainbow label of the 1960s. 9. 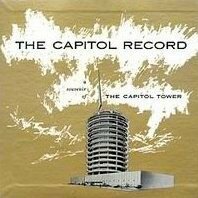 Title: The Capitol Souvenir Record ... World's Most Modern Record Pressing Plant / Format: EP / Label: Capitol / Release Year: 1965 / Cat. Num. : Spro 2905 / Note: "A look at the newest part of Capitol's entertainment world! 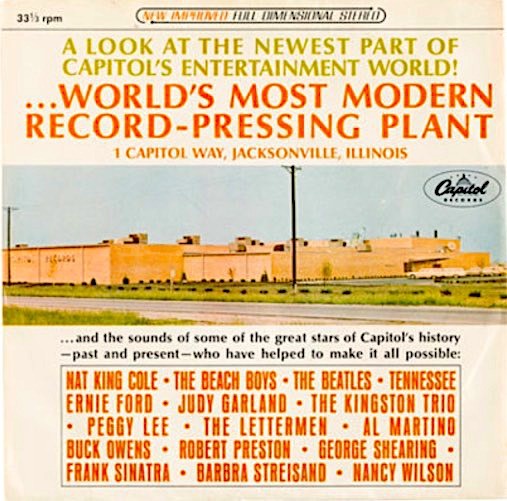 ... World's most modern record-pressing plant ... and the sounds of some of the great stars of Capitol's history - past and present - who have helped to make it all possible." The pressing plant in question was at Jacksonville, Illinois, and this EP was apparently issued as a souvenir on the occasion of the plant's opening. All 15 performances, including Peggy Lee's "Fever," are heard in very abbreviated (less than a minute-long) form. 10. 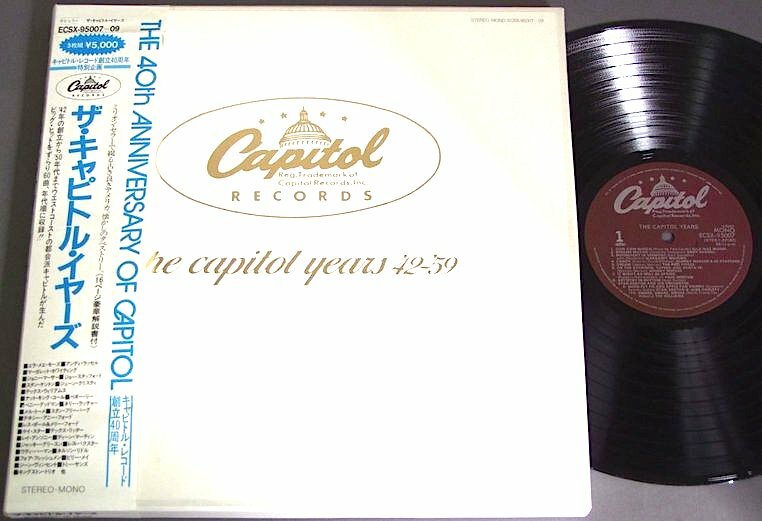 Title: Capitol Presents Those Classic Years, 1948-1956 / Format: LP & Cs & 8-t / Label: Capitol / Release Year: 1974 / Cat. Num. 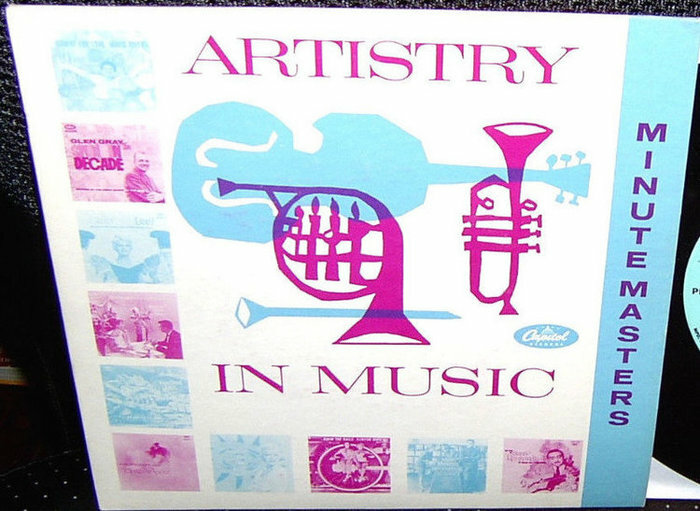 : (United Kingdom) E St 23368 / Note: Kay Starr and Peggy Lee are the only female artists pictured in the front cover of this anthology, which contains Lee's 1948 hit recording of "Mañana." 11. 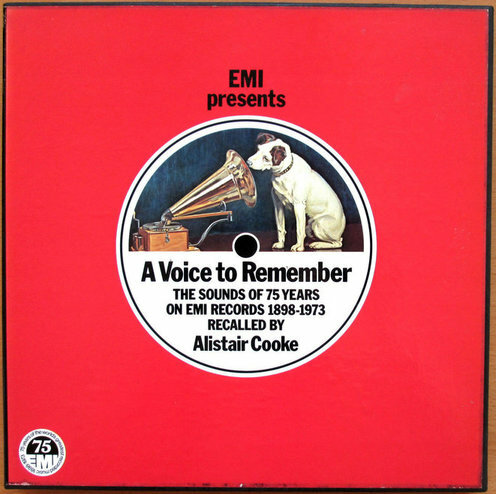 Title: A Voice To Remember: The Sounds of 75 Years On EMI Records, 1898-1973 (Recalled By Alistair Cooke) / Format: LP / Discs: 2 / Label: EMI / Release Year: 1973 / Cat. Num. : (United Kingdom) / Note: In September of 1973, British EMI released this set as parti f its 75th anniversary commemoration, featuring narration by broadcaster-journalist Alistair Cooke (best remembered for his lengthy hosting of PBS' Masterpiece Theatre). The chosen artists ranged from Enrico Caruso and Noel Coward to Cliff Richard and Pink Floyd. French legends such as Edith Piaf and Maurice Chevalier also made the list, too. Only two American members of Capitol's 1940s-1950s roster managed to get it, though: Nat King Cole ("Sweet Lorraine") and Peggy Lee ("Till There Was You"). 12-14. 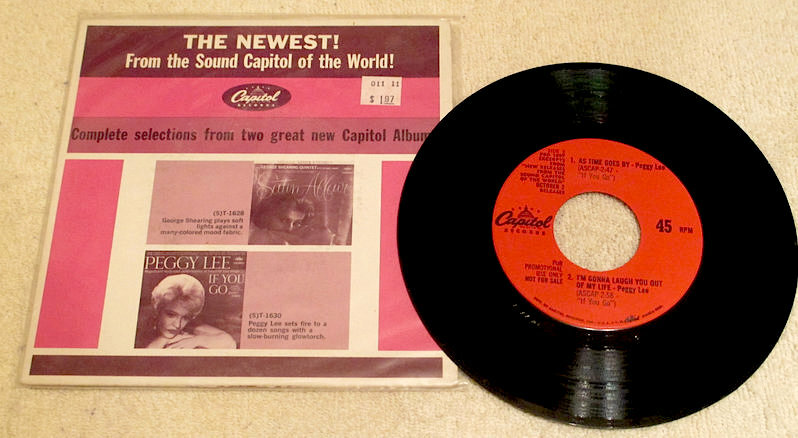 Title: The Capitol Years, '42-'59 / Format: LP / Discs: 3 / Label: Capitol / Release Year: unknown / Cat. Num. 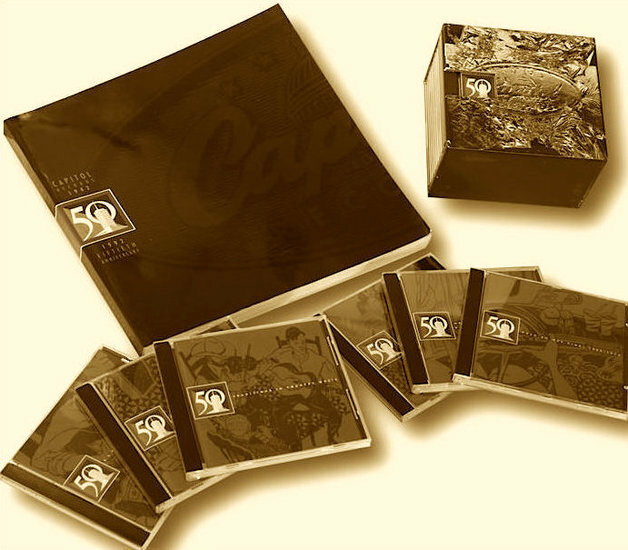 : (Japan) Ecsx 95007~950009 / Note: This chronologically sequenced anthology of Capitol hits contains two Peggy Lee renditions, "Mañana" and "Fever." Above, its front cover is displayed with and without the set's obi. 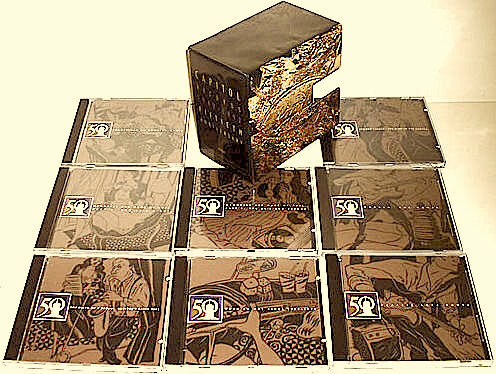 The central image focuses on the set's booklet. 15. 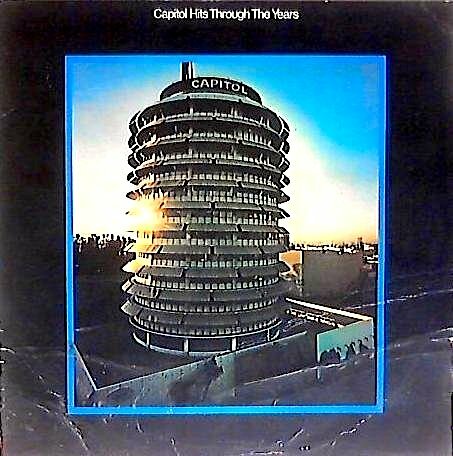 Title: Capitol Hits Through The Years (1942-1969) / Format: LP / Label: Capitol / Release Year: 1969 / Cat. Num. 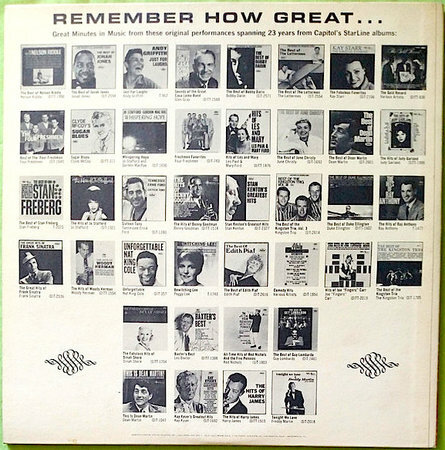 : Pro 4724 / Note: "... We've gathered here Capitol's top hits from the company's inception in 1942 to halfway through 1969, as we go to press," proclaims the producer of this album in its back cover. 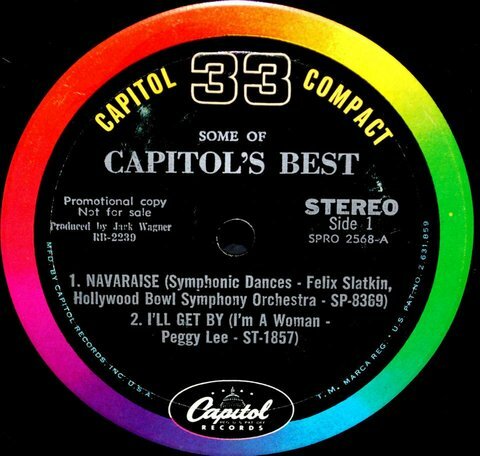 The album contains samples or snippets of 133 Capitol hit numbers, including three Peggy Lee hits ("It's A Good Day," "Golden Earrings," and "Mañana"). 16. 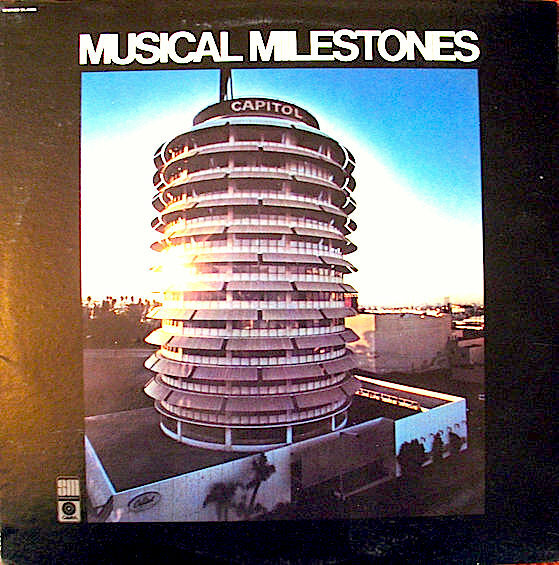 Title: Musical Milestones / Format: LP / Label: Capitol Special Markets - Plantation House / Release Year: 1972 / Cat. Num. 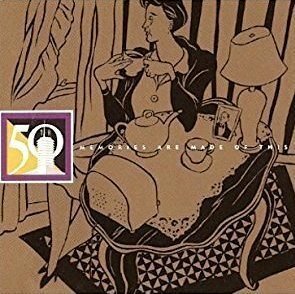 : Sl 6806 / Note: Proceeds chronologically from Ella Mae Morse's landmark recording of "Cow Cow Boogie" in 1942 to Al Martino's "Love Theme From The Godfather in 1972. The penultimate cut is Peggy Lee's rendition of "Is That All There Is?," recorded and released in 1969. Among the other featured artists are Johnny Mercer, Nat King Cole, Jo Stafford, Kay Starr, Dean Martin, and Glen Campbell. All tracks from the pre-stereo era have been electronically "enhanced." 17-22. 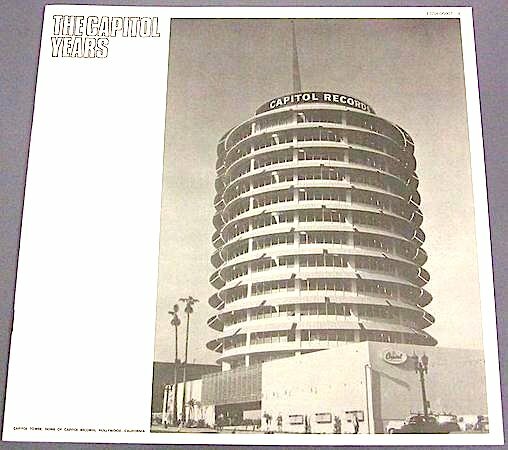 Title: Capitol Records, Fiftieth Anniversary; 1942 -1992 / Format: CD / Volumes: 8 / Label: Capitol EMI / Cat. Num. : 79176 / Rel. Year: 1992 / Note: Three of this set' tracks feature Peggy Lee's voice. Two of them are from her own record sessions; the remaining one is from a Capitol roster number on which she was among the participants. The trio of tracks is distributed among two of the set's eight discs, and they will be identified in the next paragraphs. In the pictures above, all the images highlight the set itself, except for the 4th and the 6th, which showcase the front covers of the CDs on which Lee's vocals can be found. 20. Title: The Birth of A Dream; Capitol's Early Hits / Format: CS & CD / Label: EMI-Capitol / Cat. Num. : 98664 / Rel. Year: 1992 / Note: Includes Peggy Lee's Capitol recording of "Mañana" and also the ensemble number "The Freedom Train." 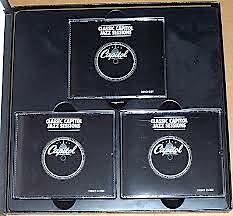 Though officially part of the 8CD box Capitol Records, Fiftieth Anniversary; 1942 -1992, this CD was sold separately, too. 22. 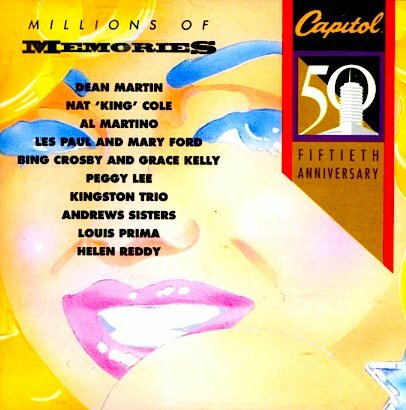 Title: Memories Are Made Of This, Part 1; The 50's & 60's / Format: CD / Label: EMI-Capitol / Cat. Num. : 0777 7 98670 2 / Rel. Year: 1992 / Note: Includes Peggy Lee's Capitol recording of "Fever" (1961 Basin Street East LP version). 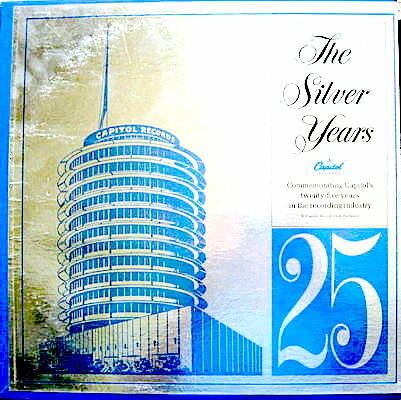 Though officially part of the 8CD set Capitol Records, Fiftieth Anniversary; 1942 -1992, this CD was also sold separately. 23. 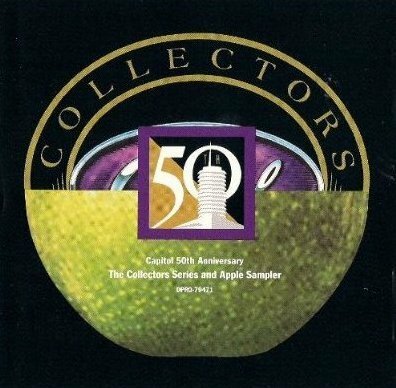 Title: The Collectors Series And Apple Sampler ("Capitol 50th Anniversary" Series) / Format: CD / Label: EMI-Capitol / Cat. Num. : 79471 / Rel. Year: 1992 / Note: Contains Peggy Lee's Capitol recording of "Caramba! It's The Samba." Features a total of 22 tracks, including six from the Beatles-owned, EMI-distributed Apple Records catalogue. 24. 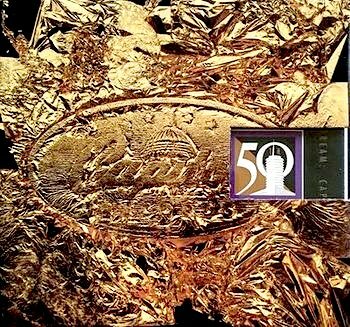 Title: Capitol Jazz 50th Anniversary Jazz Collection / Format: CD / Volumes: 3 / Label: Capitol Jazz / Cat. Num. : 7 98931 2 / Rel. Year: 1992 / Note: Includes The Capitol Jazzmen's recording of "That Old Feeling," which features Peggy Lee on vocals. 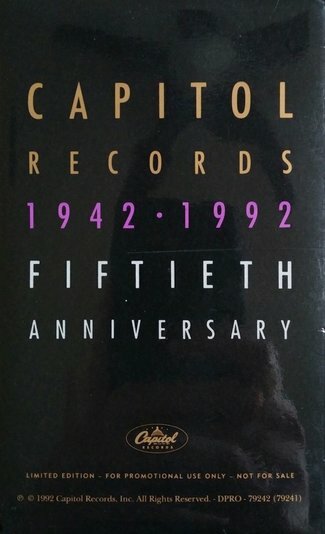 Notice that this item is different from the 8CD set mentioned above, Capitol Records, Fiftieth Anniversary; 1942 -1992, though they are obviously related. 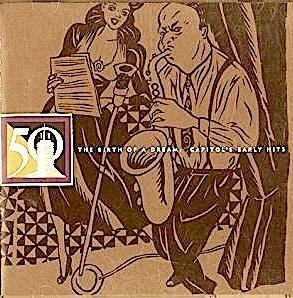 Both sets are part of Capitol's 50th Anniversary releases and both bear very similar titles, but this item is a 3CD set exclusively dedicated to jazz-oriented numbers. 25. 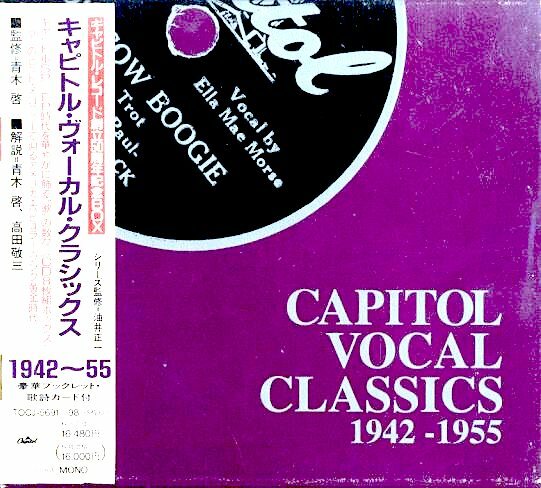 Title: Millions Of Memories ("Capitol 50th Anniversary" Series) / Format: CD / Label: EMI-Capitol / Cat. Num. : 0777 7 99119 2 / Rel. Year: 1992 / Note: Peggy Lee's Capitol recording of "Fever" is among this compilation's tracks. 26-28. 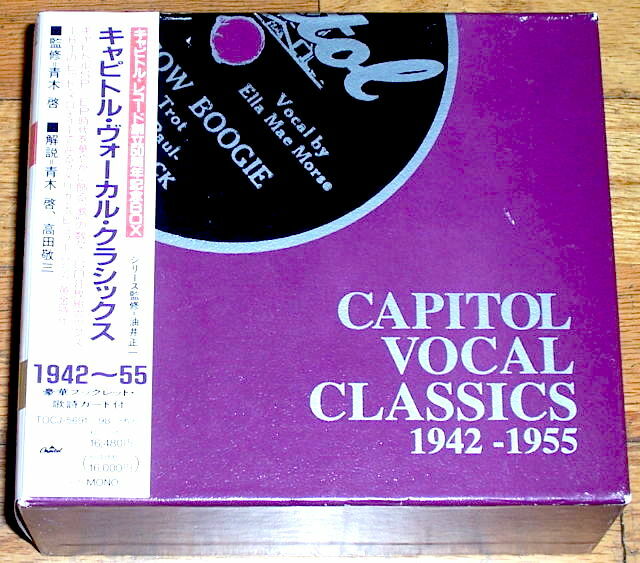 Title: Capitol Vocal Classics, 1942 -1955 / Format: CD / Discs: 8 / Label: Blue Note Toshiba / Cat. Num. : (Japan) Tocj 5691-5698 / Rel. Year: 1992 / Note: This Japanese collection contains 16 Peggy Lee vocals. Details about it are scarce. 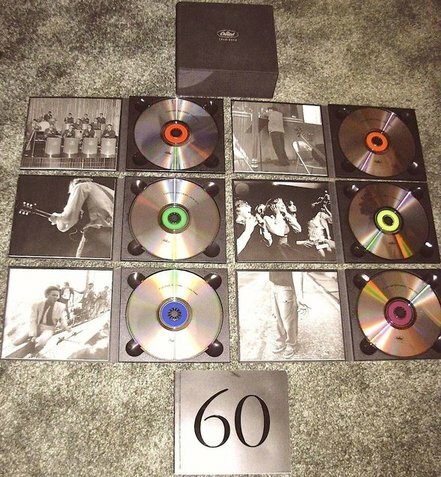 The 8CD set appears to be belong to the batch of domestic and non-domestic CD retrospectives that were released in celebration of Capitol's 50th anniversary. 29-32. 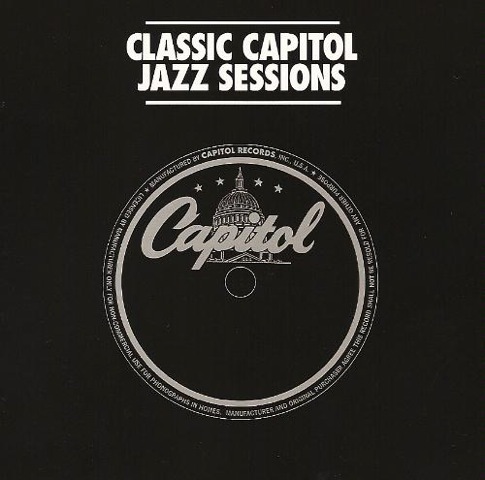 Title: Classic Capitol Jazz Sessions / Format: LP & CD / Discs: 19 [LPs] & 12 [CDs] / Label: Mosaic / Cat. Num. : Mq19 (LP) & Md12 170 (CD) / Rel. Year: 1997 / Note: Includes The Capitol Jazzmen's recordings of "Ain't Goin' No Place" and "That Old Feeling," both of which showcase Peggy Lee on vocals. Also includes the Ten Cats And A Mouse instrumental versions of "Ja-Da" and "Three O'Clock Jump," both of which feature Lee on drums. The front cover of the set can be seen in the second of the images above. The CD edition is viewable in the first image, the LP edition in the third image. The last image offers a partial look of the booklet. 33-35. 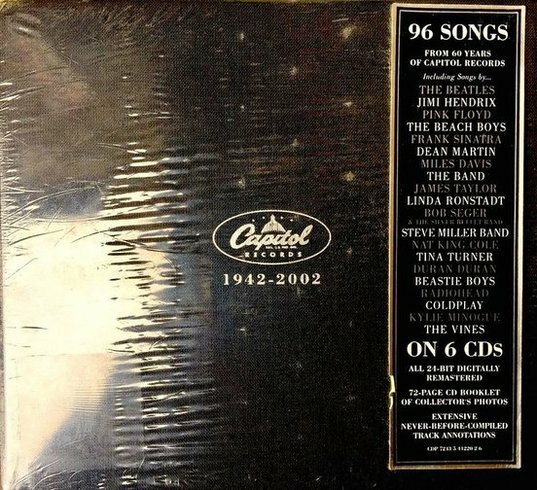 Title: Capitol Records 1942-2002; 60th Anniversary / Format: CD / Discs: 6 / Label: EMI-Capitol / Cat. Num. : 7243 5 41220 2 6 / Rel. Year: 2002 / Note: Peggy Lee's Capitol recordings of "Fever" and "It's A Good Day" are among the 96 tracks featured in this retrospective. The first image shows the front of this large box (over 10 inches in both length and width). 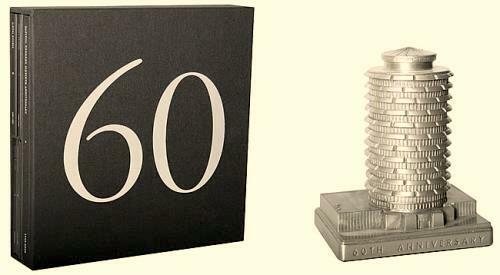 The back cover can be seen in the second image, which also displays a model replica of the Capitol Tower. This 4" metal replica was part of the set, as sold by EMI. (Nowadays, sellers tend to offer the set without that original component.) A 144-page book is part of the set, too. 36-38. 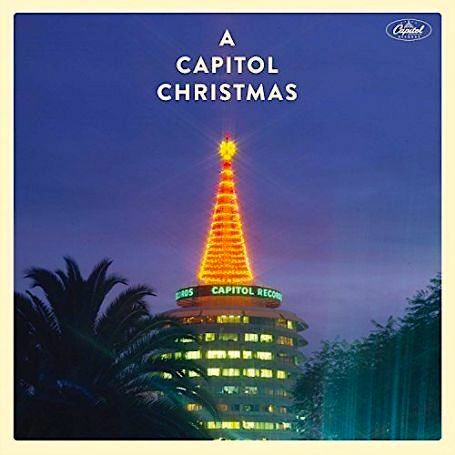 Title: A Capitol Christmas / Format: 2-LP & CD / Label: Universal / Cat. Num. : B0025560-01 & B0025275-02 / Rel. Year: 2016 / Note: In 2016, Universal commemorated Capitol's 75th anniversary with a long-term celebration that, according to a press release, "commence[d] ... when Capitol bec[a]me the first record company to receive a star of recognition from the Hollywood Chamber of Commerce," which in turn led the city of Los Angeles to declare that date (November 15) Capitol Records Day. According to the same press release, this vinyl reissue program was scheduled to be a year-long endeavor (thus presumably active from November 2016 to November 2017). Stated as having been carried out in partnership with Crate And Barrel, the program distributed and sold the LPs through the esteemed chain's stores. 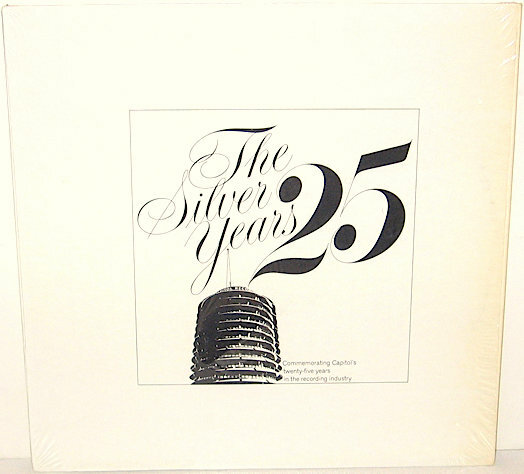 Rather than on anthologies, the label's reissue celebration focused on single albums that a panel chose as "the best of Capitol Records from among literally thousands of works the company has released over the past 75 years." The list assembled by this panel has been justifiably criticized for its notorious exclusions. The earliest album (The Duke Plays Ellington) dates from 1953, thereby ignoring the previous 11 years on which some major Capitol "works" or "albums" were also issued. (Granted, those were the yeas of shellac, rather than vinyl. Still, on a project of this magnitude, there is no justification to ignore albums on the basis of the material on which they were pressed. Moreover, bear in mind that many of the shellac albums in question were subsequently reissued on vinyl.) Peggy Lee is represented with her 1969 album Is That All There Is? (a LP that could hardly be deemed her best, and which must have been chosen chiefly on account of its inclusion of the titular hit). On the matter of 75th anniversary retrospectives or anthologies, none were issued (at least, not to my knowledge), except for the holiday item shown above. 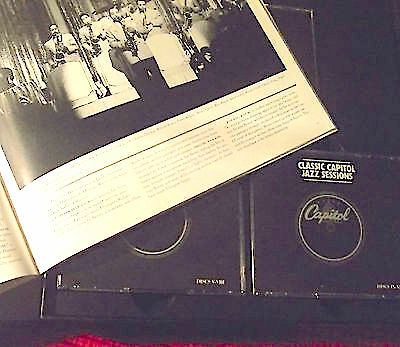 A Capitol Christmas came as both a CD and a 2LP set containing 24 seasonal songs from Capitol's and Liberty's vaults. 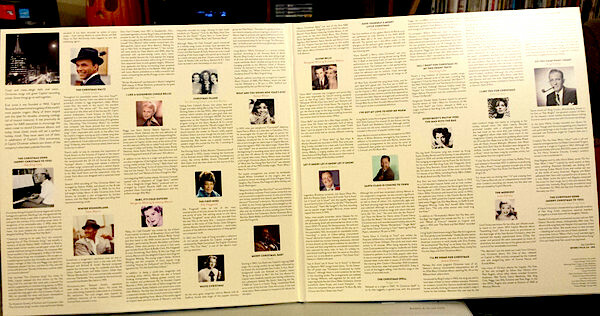 The vinyl edition is a gatefold album, and it includes the above-seen artist pictures. On the CD, the photos and the accompanying annotation are featured in a booklet. Then there is the misguided, overtly ignorant assertion that Lee spent a "creatively disappointing five-year retreat [at] Decca Records." Suffice it to point out that Decca was the label for which Lee recorded the albums Black Coffee and Sea Shells (among others), and that those were the years during which she branched into film, leading to an eventual Oscar nomination and to the writing of songs such as the perennial Johnny Guitar and the legendary numbers from the Walt Disney movie Lady And The Tramp. In short, the producer-annotator (whose extensive industry credits include A&R work for both Walt Disney Records and Barbra Streisand) needed to acquaint himself better with Lee's body of work before making such pronouncements. Perhaps he would have been better served by counting with a competent note fact checker. 1 & 3. Title: What's New? In Stereo (Volume 3) / Format: LP & EP / Label: Capitol / Cat. Num. : Sn3 & Pro 1176-1177 / Rel. Year: 1959 / Note: The What's New? series described itself as a "preview of new Capitol albums in full dimensional stereo." At least five volumes came out, but only the only volume to include a Lee track is the third. Note also that the volume was issued in two formats: LP (image #1, 12 tracks) and EP (image #3; 10 tracks). The featured performers are Tennessee Ernie Ford ("Twenty-one Years"), The Four Preps ("All I Have To Do Is Dream"), Paul Weston & His Orchestra (two selections), Ed Townsend ("Don't Get Around Much Anymore"), Dorothy Donegan, Red Nichols, Jack Fascinato, Dan Kaleikini & Iwalani Kamahele, Cliffie Stone, Larry Hovis (" ' Deed I Do"), and Peggy Lee with George Shearing. The Weston tracks are the ones missing from the EP. The Lee-Shearing combo is heard performing the song "Blue Prelude," from their then-upcoming collaboration Beauty And The Beat. 2 & 4. Title: Artistry In Music / Format: LP & EP / Label: Capitol / Cat. Num. : Pro 1386 & Pro 1387 / Rel. 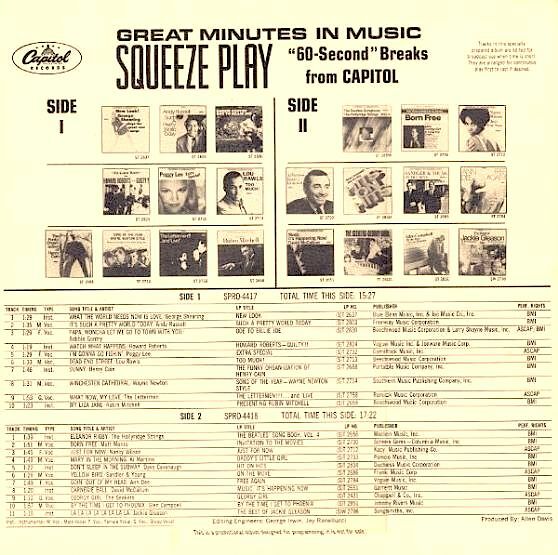 Year: 1960 / Note: Released in both LP and EP sizes, this promotional item features cuts from the dozen albums which Capitol issued during the first third of 1960. The 12 cuts on the LP are by Mavis Rivers ("The Glory Of Love), Glen Gray, Red Nichols, Les Baxter, Jackie Gleason, Dinah Shore ("When I Grow Too Old To Dream"), Kenyon Hopkins, Mark Murphy ("Personality"), Django Reinhardt ("Swing Guitars") and others. The EP features only eight of these cuts. "Heart," designated as the leading track of Lee's then-upcoming Latin Ala Lee! album, was also the Peggy Lee selection chosen for inclusion on both the LP and the EP under scrutiny. (It had also been picked for release on a commercial single.) I should also add that the above-given catalogue number applies to the LP. As for the EP, I am uncertain as to whether its catalogue number is also Pro 1386-1387, or Pro 1366-1367 instead. General Notes About The "Minute Masters" Series: The above-seen Artistry In Music EP identifies itself as a member of the "Minute Masters" series. That series consisted of promotional albums whose tracks had been edited to about one minute, in order to make them more manageable for promotional radio and television spots. 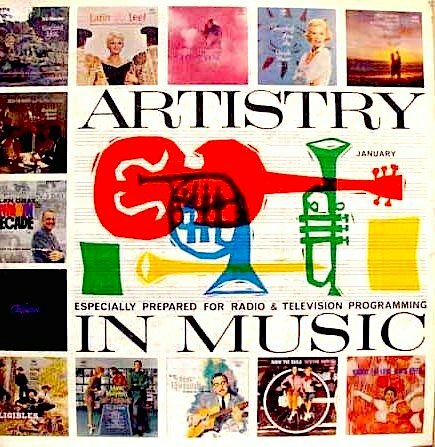 The series included not only various-artists compilations but also albums entirely dedicated to individual artists, such as Frank Sinatra and Nancy Wilson. 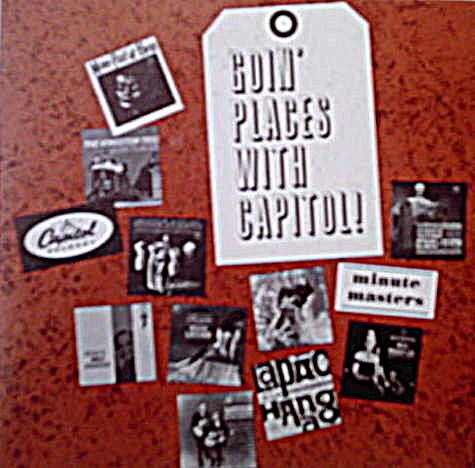 Another item from the "Minute Masters" is featured below; look for Goin' Places With Capitol. As for the other EP shown above, it also featured edited tracks, though it does not call itself a "Minute Masters" release. (Perhaps the term had not been coined yet.) Instead, its back cover prominently describes its contents as "short selections from Capitol albums." The front cover adds the adjective "sweet" to that description. 5. Title: Sounds Unlimited / Format: LP / Discs: 2 / Label: Capitol / Cat. Num. : Pro 896, Pro 897, Pro 898, Pro 899 / Rel. 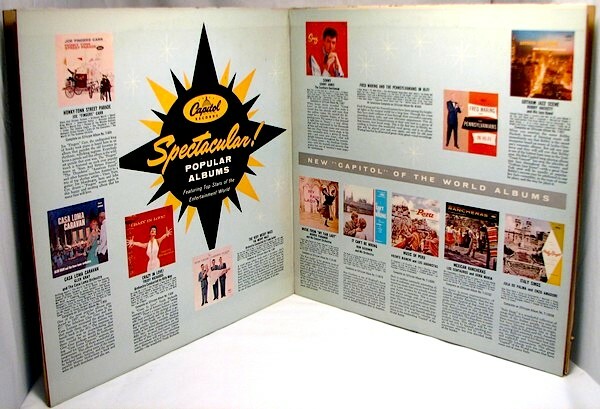 Year: 1959 / Note: This gatefold album promotes albums that Capitol was slated to release during the second quarter of 1959, or otherwise later within that year. Over 15 albums are sampled. Most if not all of thm be ar catalogue numbers that fall between 10180 and 1140, the following ones included: Les Baxter's African Jazz, Tommy Sands' This Thing Called Love, The Frank Moore Four, Eddie Dunstedster's Mister Pipe Organ, Jean Shepard's Lonesome Love, Tommy Collins' Light Of The Lord, Ron Goodwin's Music in Orbit, Pino Calvi's Italia Mia, Brendan Hogan And The Ballinakill Ceili Band's St. Patrick's Night In Dublin, and Children's Stories In Spanish. The sampled Peggy Lee LP is I Like Men! (1131), its chosen tracks "I'm Just Wild About Harry" and the number that gives the album its name. On another note, I should clarify that Capitol also gave the title Sounds Unlimited to the series' March 1959 entry (catalogue numbers Pro 967-970), which does not feature Lee tracks. 6. 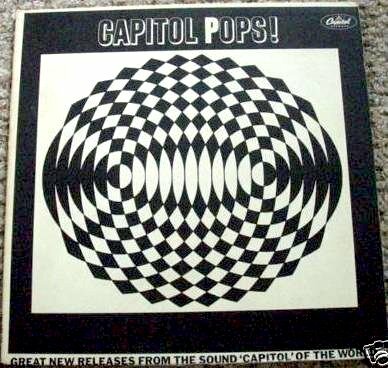 Title: Capitol Kaleidoscope / Format: LP / Discs: 2 / Label: Capitol / Cat. Num. : Pro 1166, Pro 1167, Pro 1168, Pro 1169 / Rel. Year: August 1959 / Note: This promo's Peggy Lee tracks are "If Dreams Come True" and "Always True To You In My Fashion," both from the album Beauty And The Beat!. Other sampled albums include Frank Sinatra's No One Cares, Ed Townsend's Glad To Be Here, Larry Hovis' My Heart Belongs To Only You, Jack Fascinato's Music From A Surplus Store, Webley Edwards Presents Island Paradise, Cliffie Stone's Cool Cowboy, and Renato Carosone's Carnevale Carosone. Tracks by Dorothy Donegan, Tennessee Ernie Ford, and Andy Griffith are also part of the program. 8 & 9. Title: Spectacular! / Format: LP / Pieces: 2 / Label: Capitol / Cat. Num. : Pro 363 & Pro 366 / Rel. Date: August 1957 / Note: This 2LP set includes two Peggy Lee renditions from her album The Man I Love. Found in the first side (Pro 363) of the first LP (Pro 363 - Pro 364), the renditions are "Then I'll Be Tired Of You" and "If I Should Lose You." The set's front cover identifies its contents as having been "specially prepared for radio and television programming use." 10 & 11. Title: Who's News! / Format: LP / Label: Capitol / Cat. Num. : Np 1 / Rel. Year: 1962 / Note: Released in April 1962, this anthology includes one cut from 11 then-brand new Capitol pop releases, all of them issued during the first third of that year. Among the chosen cuts is Peggy Lee's recording of "Goin' To Chicago Blues," from her album Blues Cross County, issued in March. Among the other sampled albums are Vic Damone's Strange Enchantment and Nancy Wilson's Something Wonderful. See also next images. 12 & 13. Title: Top Hits!! Top Stars!! / Format: LP / Label: Capitol / Cat. Num. : Np 2 / Rel. Year: 1962 / Note: Contains Peggy Lee's recording of "Goin' To Chicago Blues." Same LP as the one shown in image #8, with the exact same tracks albeit in a different sequence. Who's News appears to have been a budget version of the promotional item Top Hits!! Top Stars!!. Additional differences include the respective titles, the photos of the stars, and the slightly divergent catalogue numbers. 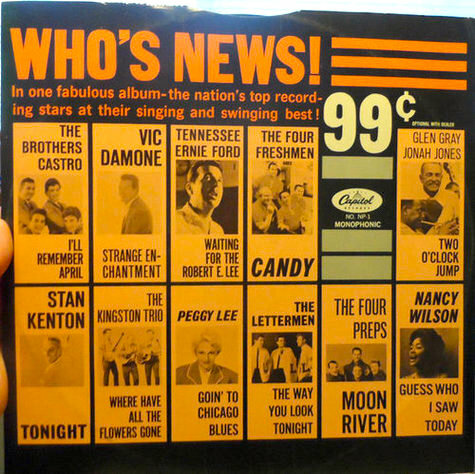 In the front cover of Who's News!, the stars are alphabetically billed, starting with The Brothers Castro and ending with Nancy Wilson. In the front cover of Top Hits!! Top Stars! 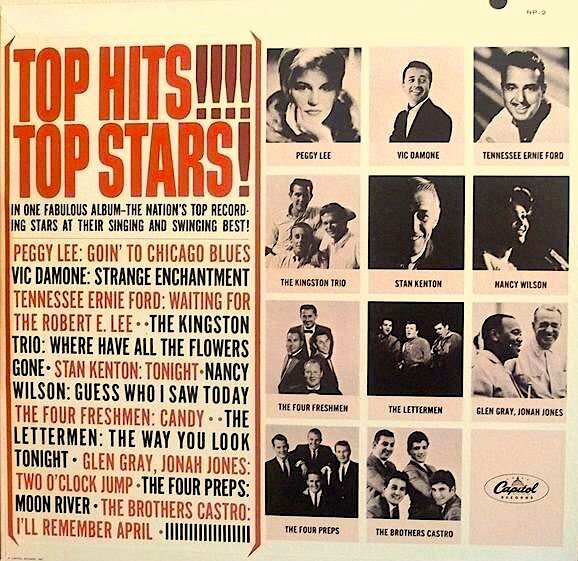 !, they would seem to be billed by their rank or popularity around early 1962; thus Peggy Lee is positioned at the uppermost top whereas The Brothers Castro occupy the last spot. 14. Title: Goin' Places With Capitol! ("Minute Masters"/"Compact 33" Series) / Format: Jukebox EP / Label: Capitol / Cat. Num. : Pro 1834 & Pro 1835 / Rel. Year: 1961 / Note: This June 1961 promotional issue includes Peggy Lee's recording of "Day In- Day Out," which was the opening track from her album Basin Street East Proudly Presents Peggy Lee. Also includes, among others, The Kingston Trio's "You Don't Knock," The Louvin' Brothers' "What A Change One Day Can Make," Les Baxter's "Sea Nymph," and Tex Ritter's "A Paradise Below." 15. Title: The Newest! From The Sound Capitol Of The World! / Format: EP / Label: Capitol / Cat. Num. : Pro 1896 & Pro 1897 / Rel. Year: 1961 / Note: On one side, this promotional EP features two vocals from Peggy Lee's album If You Go, on the other side two instrumentals from a George Shearing album. The Lee vocals are "As Time Goes By" and "I'm Gonna Laugh You Right Out Of My My Life." 16. Title: Some Of Capitol's Best / Format: Jukebox EP / Label: Capitol / Cat. Num. : Spro 2568 & Spro 2569 / Rel. Year: 1964 / Note: This promotional EP includes Peggy Lee's recording of "I'll Get By," taken from her album I'm A Woman. The other profiled artists are Felix Slatkin with The Hollywood Bowl Orchestra, Billy Liebert, and Freddy Martin. Shown above is the vinyl disc only. I have not seen a sleeve, though I presume that it came in one. 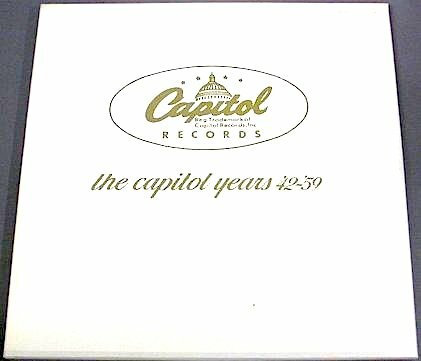 (If so, it might have been the same type of almost nondescript sleeve that the label used for many of its other jukebox EPs: black, with the word "Capitol" in a white font on top, and the Capitol logo, also in white, on the bottom. (I have no indication of a cardboard cover, but its existence is not entirely out of the question). 17-18. 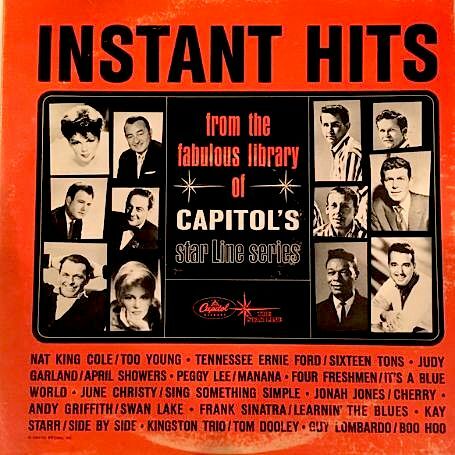 Title: Instant Hits (From The Fabulous Library Of Capitol's Starline Series) / Format: LP / Discs: 2 / Label: Capitol / Cat. Num. : Pro 2505 & Pro 2506 & Pro 2507 & Pro 2508 / Rel. Date: January 1964 / Note: This 46-track sampler from the American Star★Line series contains two Peggy Lee hits, "Mañana" and "Hallelujah, I Love Him So." 19-20. 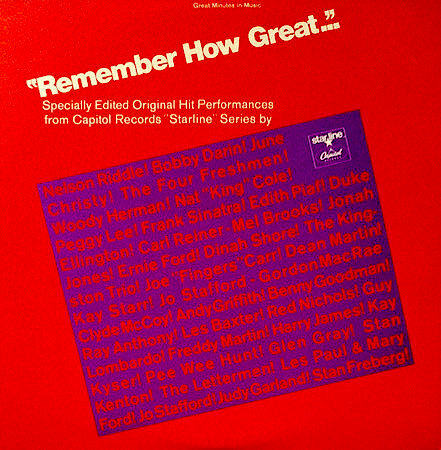 Title: "Remember How Great ... " Specially Edited Original Hit Performances From Capitol Records' Starline Series / Format: LP / Label: Capitol / Discs: 2 / Cat. Num. : Pro 4174 & Pro 4177 / Rel. Year: ca. 1965 / Note: An anthology of master cuts from albums that Capitol had released in its Starline series. Aimed at radio broadcast, each master has been abbreviated. Two of the chosen tracks, "Fever" and "Hallelujah I Love Him So," are from the Peggy Lee LP Bewitching-Lee!. "Fever" (3:19) has been cut down to 1:47 by skipping three of the verses sung by Lee. "Hallelujah I Love Him So" has been similarly pared down, from 2:26 to 1:25. 21-24. Title: Music For Christmas Shoppers Only ... / Format: LP / Label: Capitol / Cat. Num. : Pro 4210 & Pro 4211 / Rel. 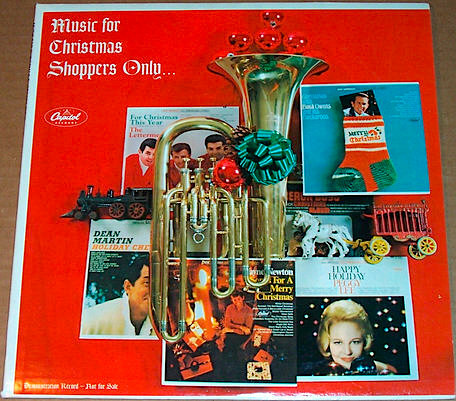 Year: 1966 / Note: Music For Christmas Shoppers Only ... contains Peggy Lee's recordings of "Jingle Bells (I Like A Sleighride)" and "Christmas Carousel." 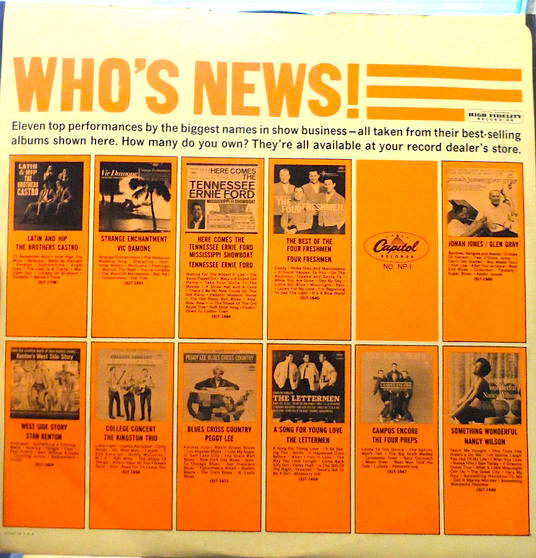 This promotional album was exclusively designed for (dis)play at retail stores. 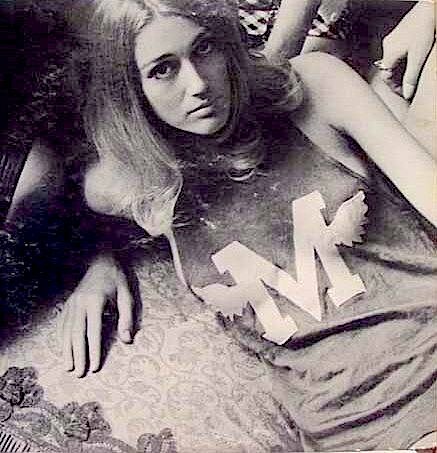 It was part of Capitol's 1966 holiday campaign, which the label devised around several print ads. 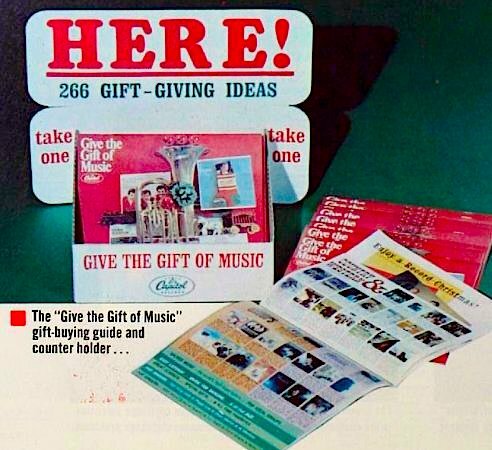 The most notable item from the campaign was a record-buying guide or almanac, called Give The Gift Of Music (image #18). The guide showcased 266 albums from the Capitol and Angel family of labels. 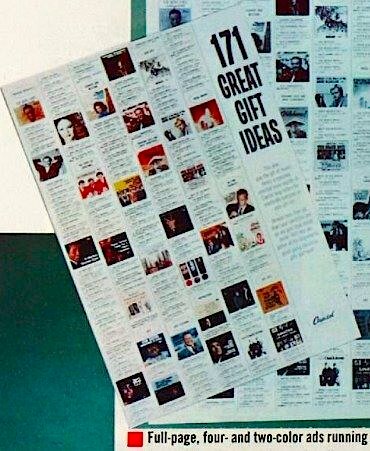 There were also several paper ads, including the one sampled above (second of the four images above), which listed 171 albums, one of them being Guitars Ala Lee!. 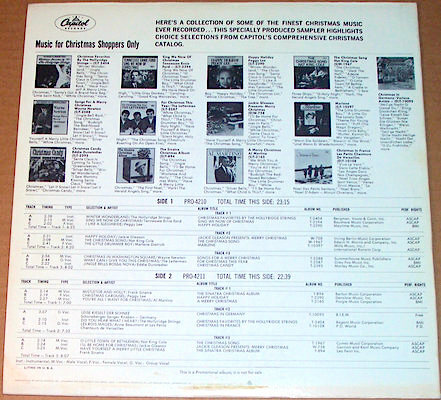 Though no link is overtly acknowledged, a connection between Music For Christmas Shoppers Only ... and Silver Platter (an album series that will be discussed elsewhere in this page) is evident from the similar catalogue numbers, and also from the way in which the respective back covers are designed. 25-26. 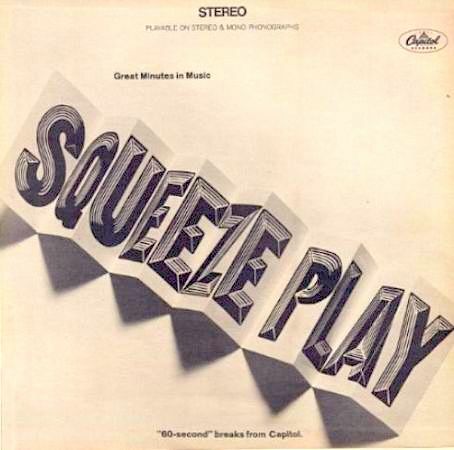 Title: Squeeze Play (Great Minutes In Music; "60-Second" Breaks From Capitol) / Format: LP / Label: Capitol / Cat. Num. : Spro 4417 & Spro 4418 / Rel. Date: 1968 / Note: This 20-track sampler offers just 60 seconds from each selection. 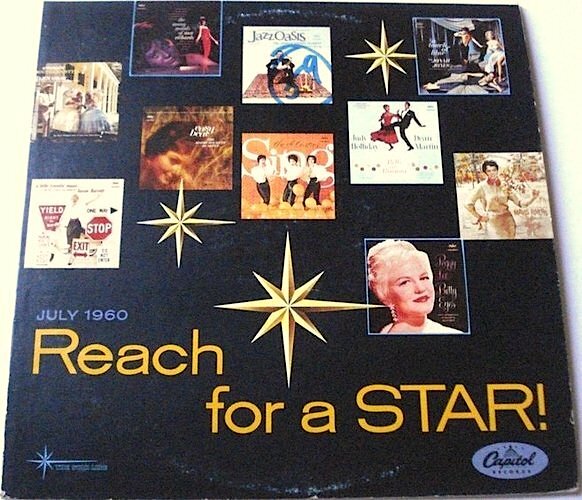 Among the albums sampled is The Hits Of Peggy Lee, from Capitol's Star★Line series. "I"m Gonna Go Fishin' " is the album pick. 27. Title: Instant Music / Format: LP / Label: Capitol / Cat. Num. : Pro 2223 & Pro 2224 / Rel. Year: 1963 / Note: Contains a four-track sequence taken from the Peggy Lee album Sugar n' Spice. The sequence starts with "Big Bad Bill" and continues with "I've GotThe World On A String" and "The Sweetest Sounds," thereafter closing with "I Don't Wanna Leave You Now." 28-29. Miscellanea / Explanatory Note. 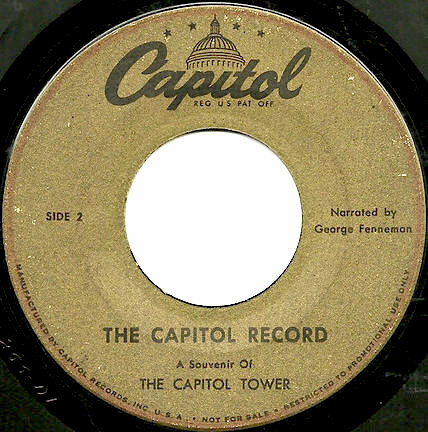 Naturally, Capitol Records had begun producing promotional records during its foundational days -- that is to say, long before the LP era. Those earlier promos were 78-rpm discs. An illustrative example has been supplied right above. 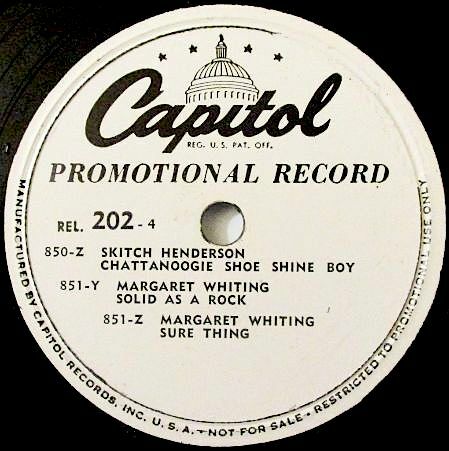 Dating from 1949, Capitol promotional record #202 culls together the contents of three sequentially numbered Capitol singles, beginning with one by Peggy Lee (#849) and concluding with one by Margaret Whiting (#851). Note that one side of the 10" disc is identified as 202-3, the other 202-4. It is likely that Capitol also produced a 202-1, 2002-2, 2002-5, an 202-6. Together, the batch would have comprised all the singles released by Capitol on any given season. 1. 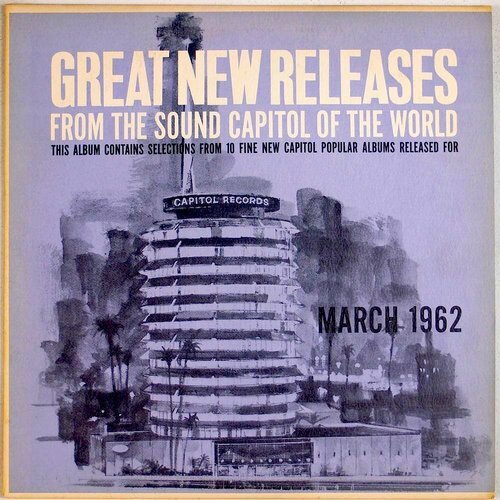 Title: Great New Releases From The Sound Capitol Of The World, March 1962 / Format: LP / Label: Capitol / Cat. Num. : Pro 1974 & Pro 1975 / Rel. Year: 1962 / Note: Side two (i.e., Pro 1975) contains Peggy Lee's recordings of "Kansas City" and "Goin' To Chicago Blues," both taken from her album Blues Cross Country. Sequenced after Lee's are two tracks by Frank Sinatra (from Point Of No Return, his last original album for Capitol) and then tracks by Edith Piaf, Freddy Martin, and Woody Herman. Side one starts out with numbers culled from Nat King Cole's album with George Shearing and continues with renditions by Kay Starr ("I Am Alone Because" and "Baby, Won't You Please Come Home," from her I Cry By Night LP), Stan Kenton, and Ruth Welcome. 2. 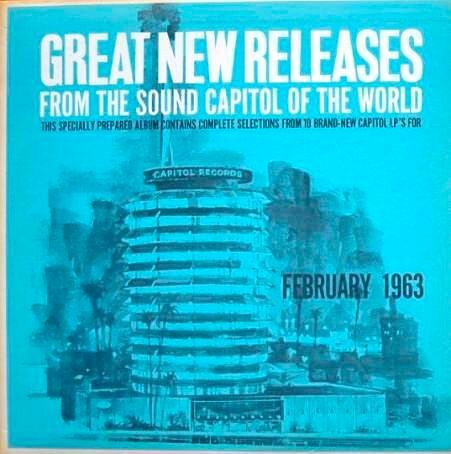 Title: Great New Releases From The Sound Capitol Of The World, February 1963 / Format: LP / Label: Capitol / Cat. Num. : Pro 2280 & Pro 2281 / Rel. Year: 1963 / Note: Closes with Peggy Lee's recording of "I'm Walkin'," taken from her album I'm A Woman. Also includes her interpretation of "The Alley Cat Song," from the same album. 3. 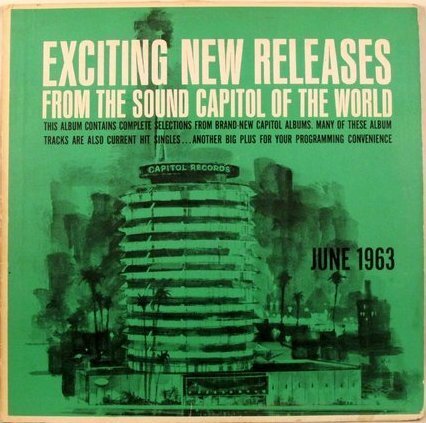 Title: Great New Releases From The Sound Capitol Of The World, June 1963 / Format: LP / Label: Capitol / Cat. Num. : Pro 2376 & Pro 2377 / Rel. Year: 1963 / Note: Opens with Peggy Lee's recording of "The Lady Is A Tramp," taken from her album Mink Jazz. Not knowing which tracks are on the B side of this LP, I cannot say if there are any additional Peggy Lee recordings in it. 4. 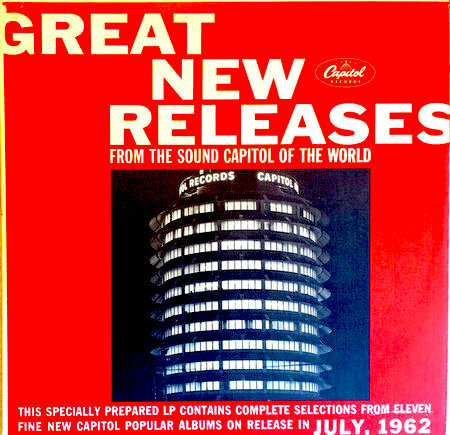 Title: Great New Releases From The Sound Capitol Of The World, July 1962 / Format: LP / Label: Capitol / Cat. Num. : Pro 2068 & Pro 2069 / Rel. Year: 1962 / Note: Side 1 includes Peggy Lee's Capitol recording of "Why Don't You Do Right," taken from the 1962 compilation Bewitching-Lee!. 5. Title: Great New Releases From The Sound Capitol Of The World / Format: LP / Label: Capitol / Cat. Num. : Pro 2537 & Pro 2538 / Rel. Date: February 1964 / Note: This promotional item opens with Peggy Lee's rendition of "The Moment Of Truth," taken from her album I'm In Love Again. Following her rendition are recordings by Nat King Cole ("Something Makes Me Want To Dance With You"), Freddy Martin, Frank Sinatra ("Nice And Easy"), Billy Taylor, and Sue Raney ("Just A-Sittin' And A-Rockin'"). Among the numbers on the other side of the record are two tunes by The Beatles, which fans esteem to be the earliest ones ever featured in a Capitol promotional album. 6. Title: Great New Releases From The Sound Capitol Of The World! / Format: LP / Label: Capitol / Cat. Num. : Pro 2685 & Pro 2686 / Rel. Date: August 1964 / Note: Side 1 of this promotional item includes the titular song of Peggy Lee's 1964 Capitol album In The Name Of Love, and also another cut from the same album, "The Boy From Ipanema." 7. Title: Great New Releases From The Sound Capitol Of The World / Format: LP / Label: Capitol / Cat. Num. : Pro 2821 & Pro 2822 / Rel. Date: April 1965 / Note: Side 1 of this promotional item includes the titular song of Peggy Lee's 1965 Capitol album Pass Me By. General Note About This Series: Albums with the title From The Sound Capitol Of The World date back to at least 1959 and continue until 1965. Unfortunately, I do not have a complete list of titles. Besides the seven issues listed, quite a few others probably feature Peggy Lee tracks. In fact, I know of one more, dated November 1965 (cat. num. Pro 2966). I do not know which Peggy Lee selections are included in that album, nor do I have an image of its cover. I should also add that its full title is slightly different from that of the above-discussed majority. It's called Excerpts From New Releases From The Sound Capitol Of The World). ( In this series, the words Great New Releases are the ones most commonly found before the collective moniker From The Sound Capitol Of The World. However, the addition of the word "Excerpts" should not be deemed of great significance. Other issues bear similar variations. In some instances, the opening word New was omitted or substituted with the adjective Exciting.) On the matter of this series' destiny after 1965, see next section's general note. 1. 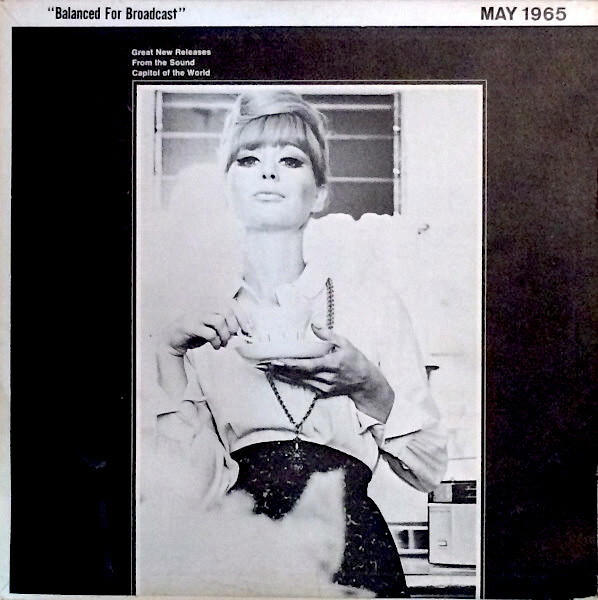 Title: Balanced For Broadcast, May 1965 / Format: LP / Label: Capitol / Cat. Num. : Pro 2850 & Pro 2851 / Rel. Year: 1965 / Note: Contains Peggy Lee's renditions of "I Wanna Be Around" and "Sneakin' Up On You," from her album Pass Me By. 2. 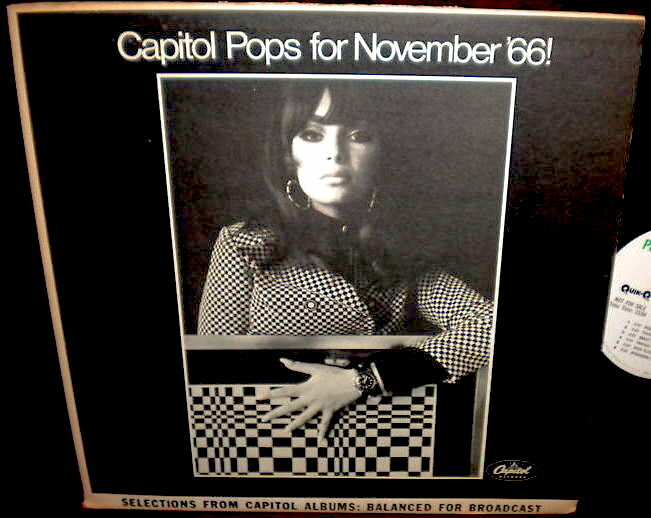 Title: Capitol Pops For November '66! / Format: LP / Label: Capitol / Cat. Num. : Pro 4196 & Pro 4197 / Rel. Year: 1966 / Note: Contains Peggy Lee's recordings of "Think Beautiful" and "An Empty Glass," from her album Guitars Ala Lee. 3. 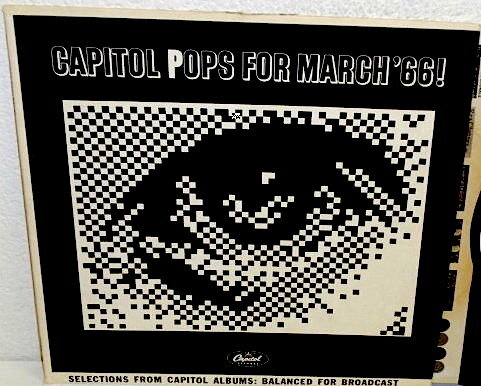 Title: Capitol Pops For March '66! / Format: LP / Label: Capitol / Cat. Num. : Pro 4030 & Pro 4031 / Rel. Year: 1966 / Note: Contains Peggy Lee recordings of "It's A Wonderful World" and "I'll Only Miss Him When I think of Him," taken from her album Big $pender. 4. 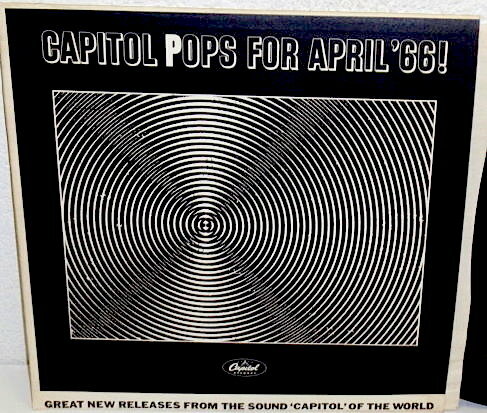 Title: Capitol Pops For April '66! / Format: LP / Label: Capitol / Cat. Num. : Pro 4055 & Pro 4056 / Rel. Year: 1966 / Note: Contains Peggy Lee's recordings of "Alright, Okay, You Win" and "I Must Know," from her album Big $pender. 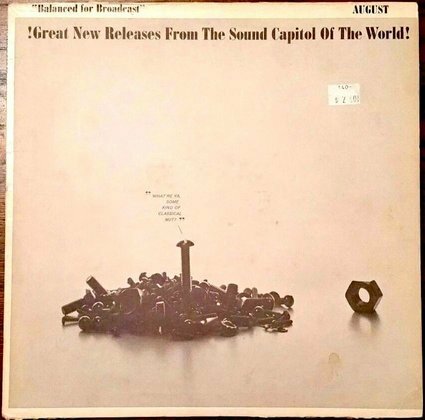 General Note About "Balanced For Broadcast": This Series seems to have been the sequel to another series, Great New Releases From The Sound Capitol Of The World, which was discussed in the previous section. Although I have not found a precise timeline for either one, a continuity from one series to the other is suggested by the albums of which I'm aware. 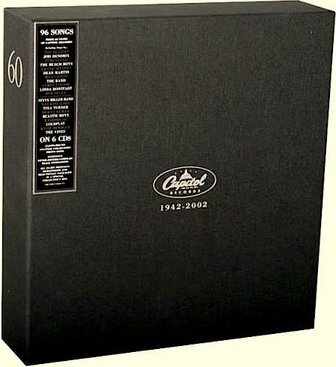 Every Great New Releases From The Sound Capitol Of The World albums which I have consulted dates from the 1959-1965 years, whereas the Balanced For Broadcast and Capitol Pops albums with which I am acquainted fall within the 1965-1966 period. The four images shown directly above are provided only for the purpose of illustrating the points made in this general note; none of those four albums include any Peggy Lee tracks. Visually, their front cover artwork certainly gives an impression of continuity and connection between the two series. 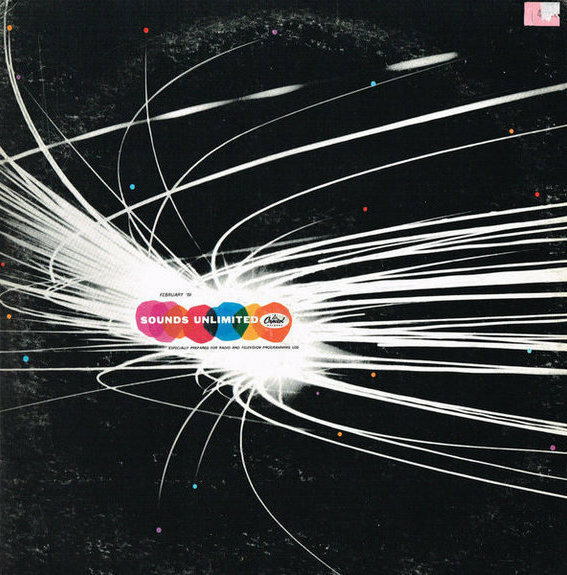 First on display is the front cover of a 1965 album titled Great New Releases From The Sound Capitol Of The World whose design follows the same "cheesecake" directive of some of the covers from the Capitol Pops series. 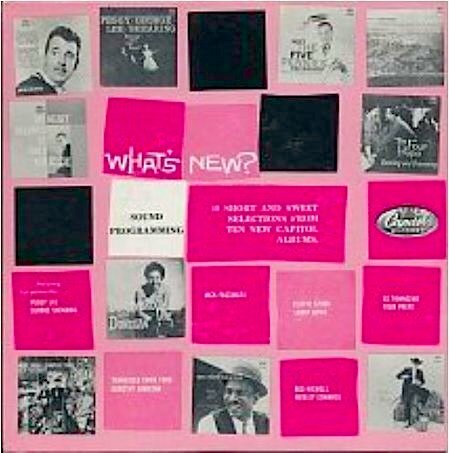 The second image shows another 1965 album whose front cover bears the words Balanced For Broadcast on the uppermost top, and the words Great New Releases From The Sound Capitol Of The World a few inches below. 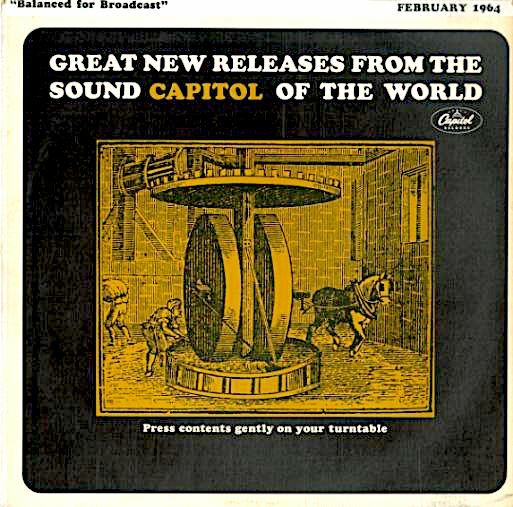 In the third image, the phrase New Releases From The Sound Capitol Of The World still appears, but the main title is clearly Capitol Pops, and the motto "balanced for broadcast" is no longer in use. This third album cover is from 1966. 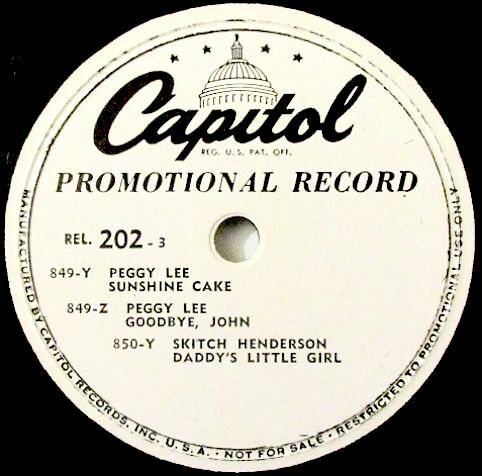 The Capitol Pops and Balanced For Broadcast issues spotlighted in the present section are not the only ones that contain Peggy Lee tracks. There were others, for which I have neither images nor enough information at the present time. 1. 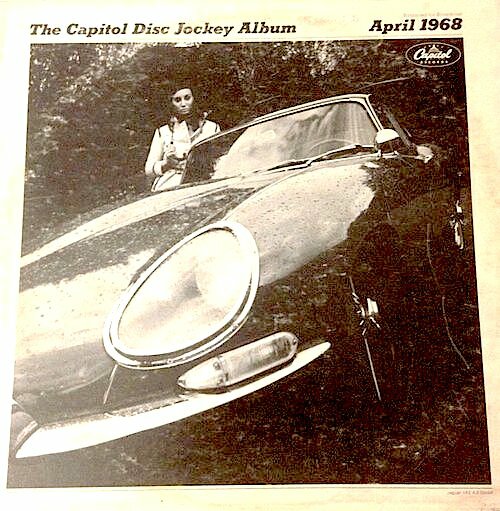 Title: The Capitol Disc Jockey Album, April 1967 / Format: LP / Label: Capitol / Cat. Num. : Spro 4315 & Spro 4316 / Rel. Year: 1967 / Note: Contains Peggy Lee's recordings of "A Bucket Of Tears" and "Amazing," culled from her anthology Extra Special! 2. 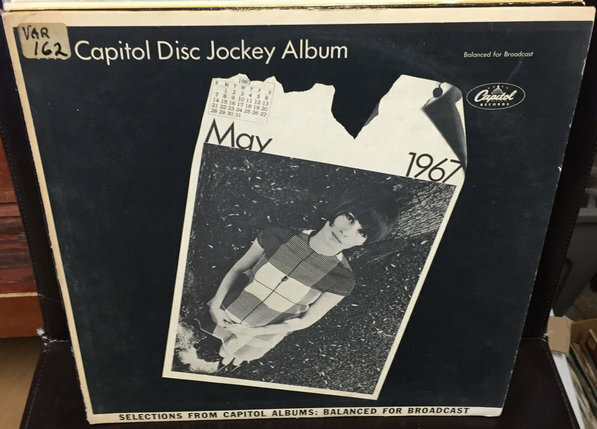 Title: The Capitol Disc Jockey Album, May 1967 / Format: LP / Label: Capitol / Cat. Num. : Spro 4332 & Spro 4333 / Rel. Year: 1967 / Note: Includes Peggy Lee's self-penned ballad "The Shining Sea," taken from her anthological album Extra Special!. 3. 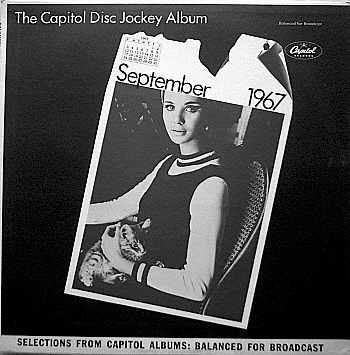 Title: The Capitol Disc Jockey Album, September 1967 / Format: LP / Label: Capitol / Cat. Num. : Spro 4388 & Spro 4389 / Rel. Year: 1967 / Note: Includes Peggy Lee recordings of "Something Stupid" and "Release Me," taken from her anthological album Extra Special!. 4. 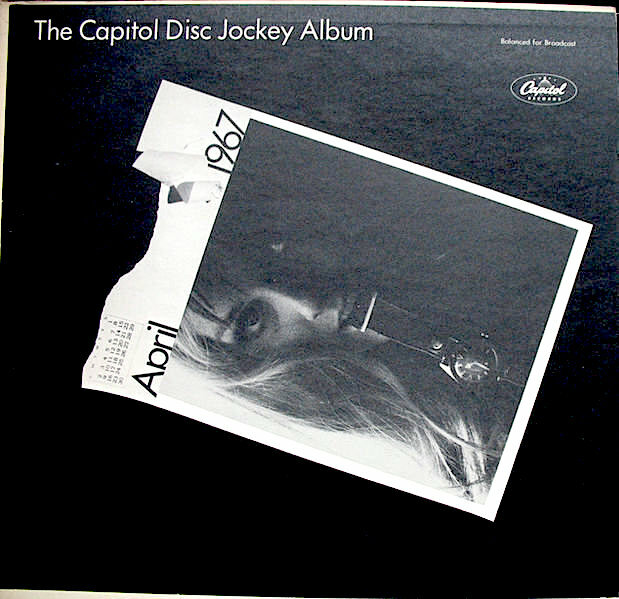 Title: The Capitol Disc Jockey Album, April 1968 / Format: LP / Label: Capitol / Cat. Num. : Spro 4520 & Spro 4521 / Rel. Year: 1968 / Note: Contains Peggy Lee's recordings of "Call Me" and "I'll Only Miss Him When I Think Of Him," from her album Big Spender. 5. 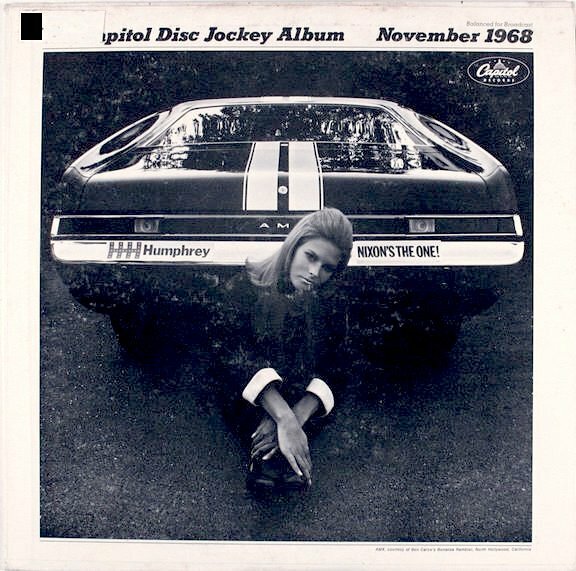 Title: The Capitol Disc Jockey Album, November 1968 / Format: LP / Label: Capitol / Cat. Num. : Spro 4650 & Spro 4651 / Rel. Year: 1968 / Note: Contains Peggy Lee's versions of "Do I Hear A Waltz" and "By The Time I Get To Phoenix," from her album Two Shows Nightly. 6. Title: The Capitol Disc Jockey Album / Format: LP / Label: Capitol / Cat. Num. : Spro 4710 & Spro 4711 / Rel. 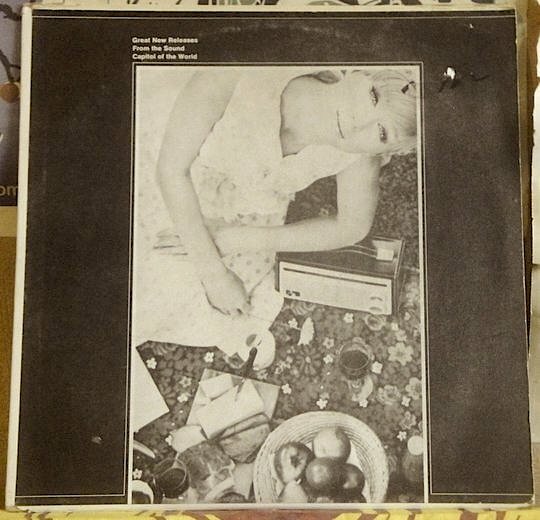 Date: May 1969 / Note: Contains Peggy Lee's renditions of "Spinning Wheel" and "I Think It's Gonna Rain Today," both from her album A Natural Woman. 7. Title: The Capitol Disc Jockey Album, / Format: LP / Label: Capitol LP: Spro / Cat. Num. : Spro 4920 & Spro 4921 / Rel. Date: January 1970 / Note: Both sides of this LP open with a Peggy Lee vocal. "Love Story" is on side 1, "Is That All There Is?" on side 2. Both tracks are from her Is That All There Is? album. 8. 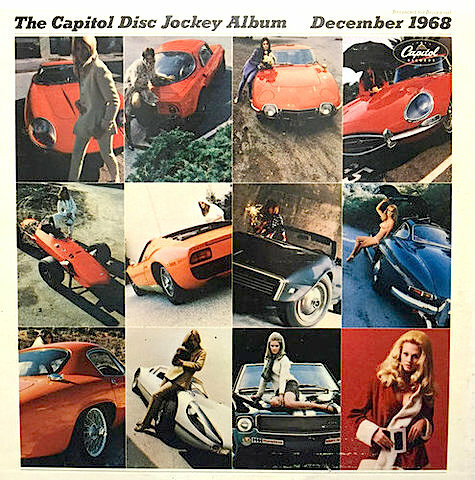 Title: The Capitol Disc Jockey Album, December 1967 / Format: LP / Label: Capitol / Cat. Num. : Spro 4456 & Spro 4457 / Rel. Year: 1967 / Note: Contains Peggy Lee's recording of "Christmas Carousel," from the album that bears the same title. General Note About This Series: Obviously aimed at radio disc jockeys, The Capitol Disc Jockey series consisted of albums that carried one of these two legends: "[t]he tracks in this especially prepared album have been arranged in a sequence suitable for broadcast first thru last as a program, or program segment, if so desired" or "the tracks in this specially prepared album have been arranged in a sequence which enable you to program the selections one after the other in the order produced on this LP ..." Furthermore, these albums invariably include the words "balanced for broadcast" in their front and/or back covers. 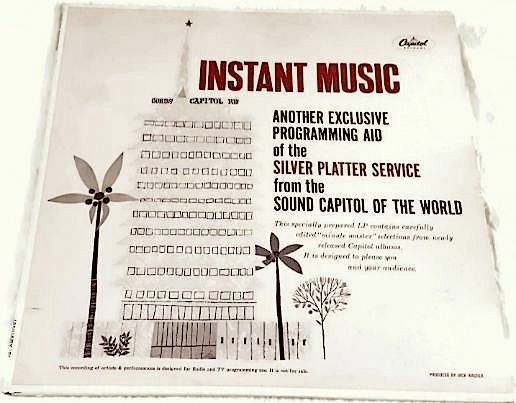 The back covers also point out that the music has been programmed with quik-q, a technology which allowed for what Capitol proudly described as "instant programming." It amounted to a lapse of two seconds between tracks. 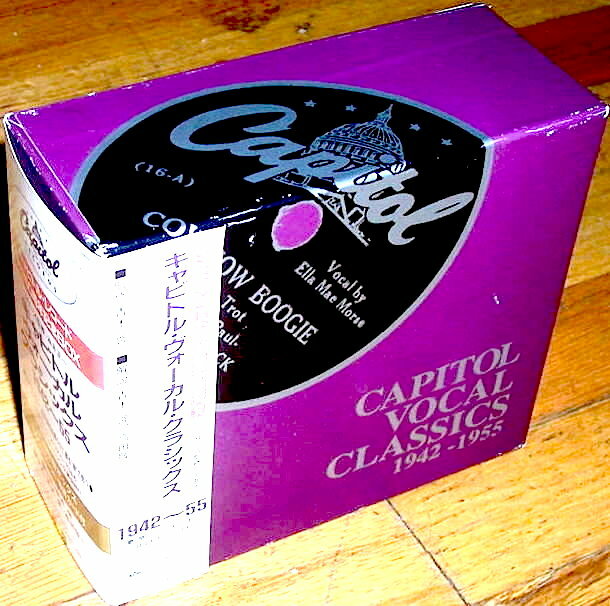 Each new volume of The Capitol Disc Jockey album was sent freely to participating music stations, on a monthly basis. The stations in question were geared toward pop music, and thus differed from the more predominant rock-oriented stations. (Capitol also had a separate paying subscription service, which gave stations greater access to the company's albums and singles.) 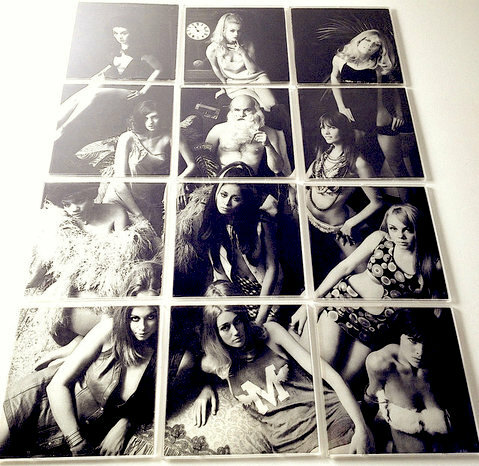 For any month of a given year, these LPs would feature the same photographic motif in their front covers, be it calendar girls (1967), girls next to high-end cars (1968), college-age girls striking suggestive poses (1969) or -- perhaps as a 'respite' from the overflow of estrogen -- radio/music technology (1970). The December issues were something of an exception, however. 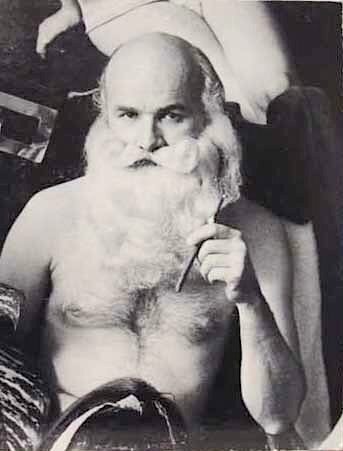 For the years 1967 and 1969, the holiday issues exchanged the typical comely women for lecherous-looking incarnations of Santa Claus -- as seen and exemplified by the very last picture of section III, which is the front cover of the December 1969 series issue. 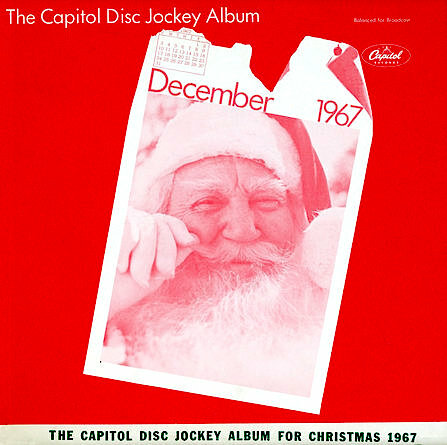 Presumably meant to send out subliminal messages, these albums' virile versions of Santa stood in for the male disc jockeys targeted by Capitol. 1. 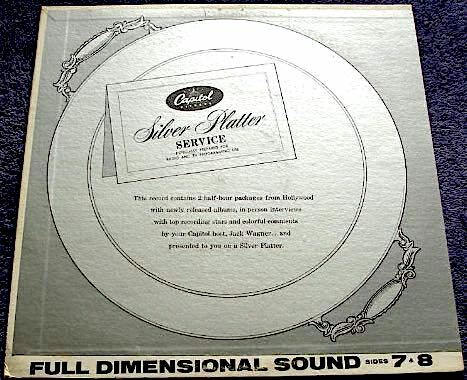 Title: Silver Platter Service, Sides 7 & 8 / Format: LP / Label: Capitol / Cat. Num. : Pro 2066 & Pro 2067 / Rel. Date: June 1962 / Note: This Silver Platter album features a brief phone interview with Peggy Lee and two numbers from her album Blues Cross Country, "Los Angeles Blues," and "New York City Blues." Also includes brief phone interviews with Nelson Riddle and Russ Morgan. 2. 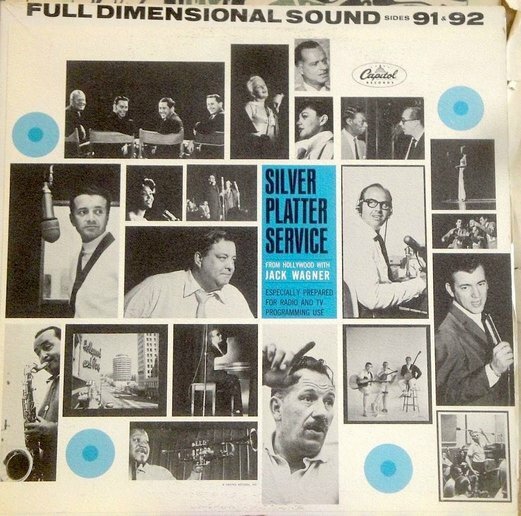 Title: Silver Platter Service, Sides 11 & 12 / Format: LP / Label: Capitol / Cat. Num. : Pro 2097 & Pro 2098 / Rel. Date: July 1962 / Note: This Silver Platter album features at least one Peggy Lee track. Further details unknown. 3. 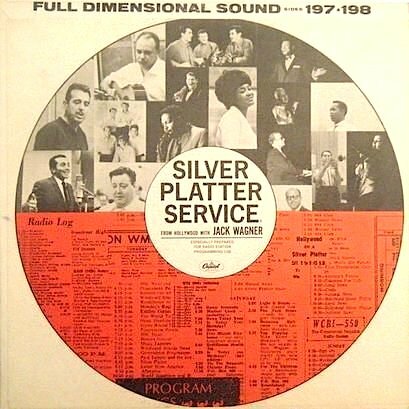 Title: Silver Platter Service, Sides 19 & 20 / Format: LP / Label: Capitol / Cat. Num. : Pro 2159 & Pro 2160 / Rel. Date: September-October 1962 / Note: This Silver Platter album features at least one vocal sung by Peggy Lee. Further details unknown. 4. 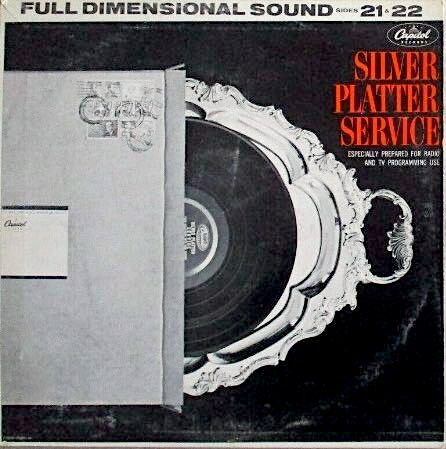 Title: Silver Platter Service, Sides 21 & 22 / Format: LP / Label: Capitol / Cat. Num. : Pro 3021 & Pro 3022 / Rel. Date: October 1962 / Note: Side 22 bears the title Spotlight On Peggy Lee. It combines about half of the album Sugar 'n' Spice with a Lee interview, conducted by Jack Wagner. 5. 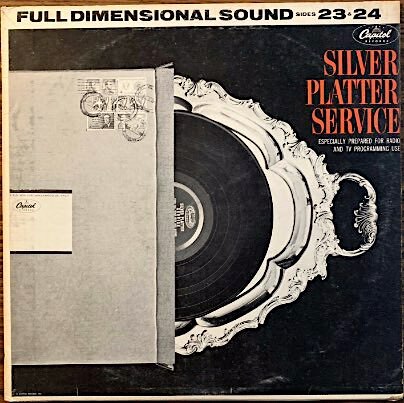 Title: Silver Platter Service, Sides 23 & 24 / Format: LP / Label: Capitol / Cat. Num. : Pro 3023 & Pro 3024 / Rel. Date: probably November 1962 / Note: This Silver Platter album contains Peggy Lee's recording of "The Best Is Yet To Come," from her album Sugar 'n' Spice. 6. 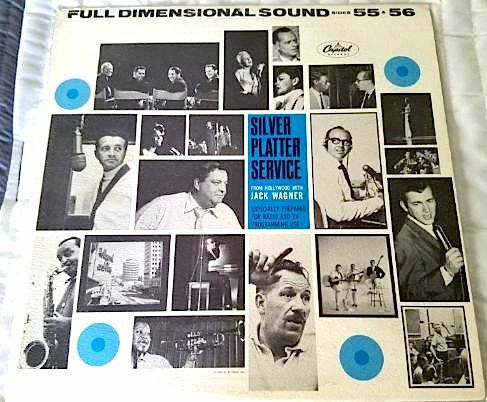 Title: Silver Platter Service, Sides 55 & 56 / Format: LP / Label: Capitol / Cat. Num. : Pro 3055 & Pro 3056 / Rel. Date: June 1963 / Note: This Silver Platter album features the Peggy Lee tracks "I Won't Dance" and "I Could Write A Book," both from her album Mink Jazz. Also featured are interviews with Billy May and Jody Miller. 7. 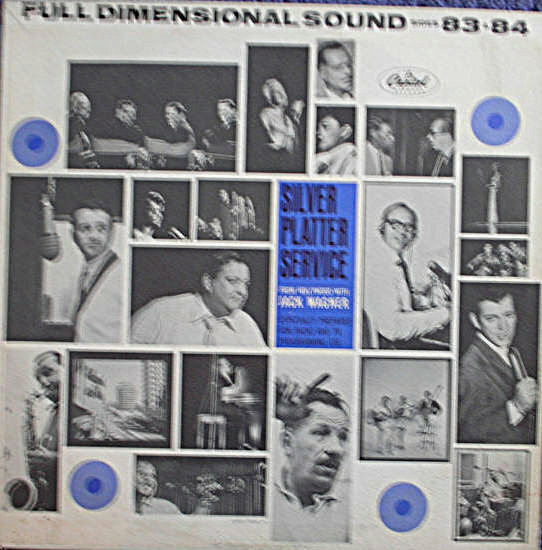 Title: Silver Platter Service, Sides 57 & 58 / Format: LP / Label: Capitol / Cat. Num. : Pro 3057 & Pro 3058 / Rel. Date: June 1963 / Note: This Silver Platter album features the Peggy Lee track "Where Can I Go Without You," from her album Mink Jazz. Also featured are interviews with Glenn Campbell and Al Martino. 8. 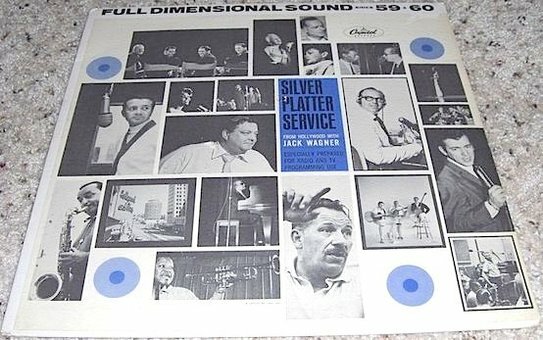 Title: Silver Platter Service, Sides 59 & 60 / Format: LP / Label: Capitol / Cat. Num. : Pro 3059 & Pro 3060 / Rel. Date: July 1963 / Note: This Silver Platter album features the Peggy Lee tracks "Whisper Not" and "As Long As I Live," both from her album Mink Jazz. Also featured are interviews with Les Brown, Nat King Cole, and Freddy Martin. 9. 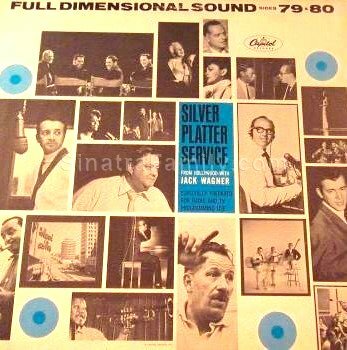 Title: Silver Platter Service, Sides 79 & 80 / Format: LP / Label: Capitol / Cat. Num. : Pro 3079 & Pro 3080 / Rel. Date: November 1963 / Note: This Silver Platter album features at least one Peggy Lee track. Further details unknown. 10. Title: Silver Platter Service, Sides 83-84 / Format: LP / Label: Capitol / Cat. Num. : Pro 3083 & Pro 3084 / Rel. Year: 1963 / Note: Contains Peggy Lee's recording of "Fever" on side 84. 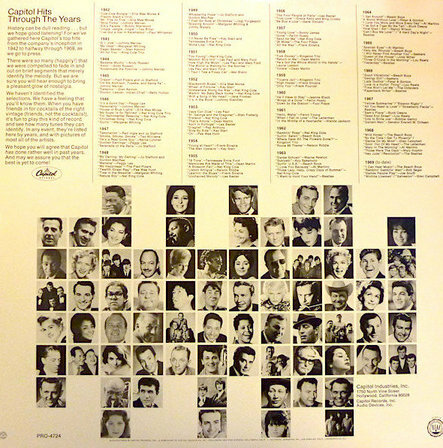 Side 83 is dedicated to the album The Story Of Christmas, and includes interviews with that album's artist (Tennessee Ernie Ford) and with the album's conductor (Roger Wagner). This LP, which also features a brief phone interview with Stan Kenton, identifies itself as a "Christmas special." 11. 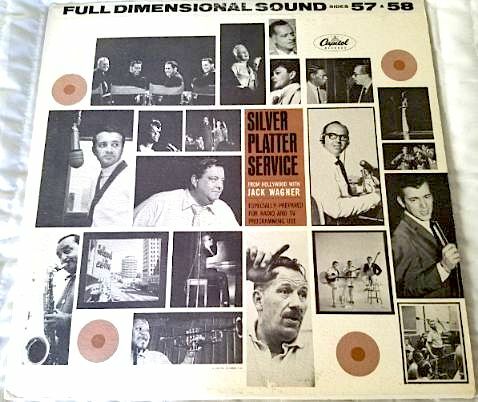 Title: Silver Platter Service, Sides 89 & 90 / Format: LP / Label: / Cat. Num. : 3089 & Pro 3090 / Rel. Year: 1964 / Note: It seems that this album (to which I have not listened) features interviews, requests or song recommendations from various disc jockeys. It includes Peggy Lee's recordings of "I've Got Your Number" (side 89) and "The Moment Of Truth" (side 90). Side 90 is dated February 1964. Side 89 is not dated, but is labeled the "Radio Jamaica and Redifussion Disc-Jockey Special." 12. 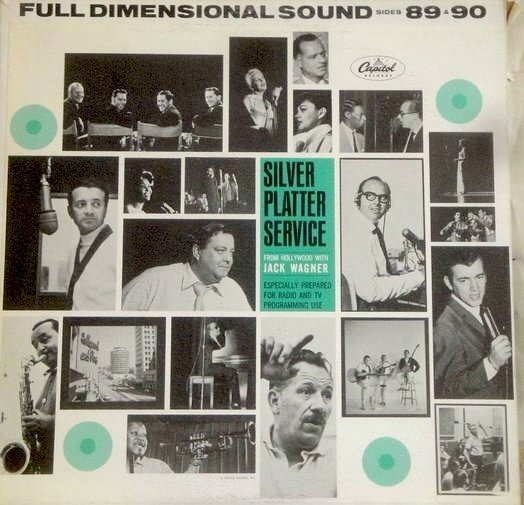 Title: Silver Platter Service, Sides 91 & 92 / Format: LP / Label: Capitol / Cat. Num. : Pro 3091 & Pro 3092 / Rel. Year: 1964 / Note: Contains Peggy Lee's recordings of "That's My Style" and "How Insensitive," from her 1963 album In Love Again. Also includes interviews with Sue Raney and Freddy Martin. Dated February 1964. 13. 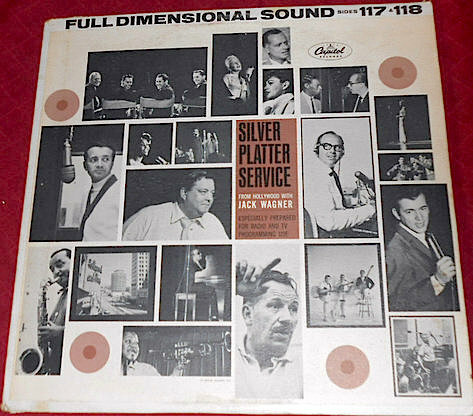 Title: Silver Platter Service, Sides 117 & 118 / Format: LP / Label: Capitol / Cat. Num. : Pro 3117 & Pro 3118 / Rel. Date: probably August 1964 / Note: Contains Peggy Lee's recordings of "Talk To Me, Baby" and "The Boy From Ipanema," from her 1964 album In The Name Of Love. Also includes brief interviews with Milt Raskin and Nancy Wilson. 14. . 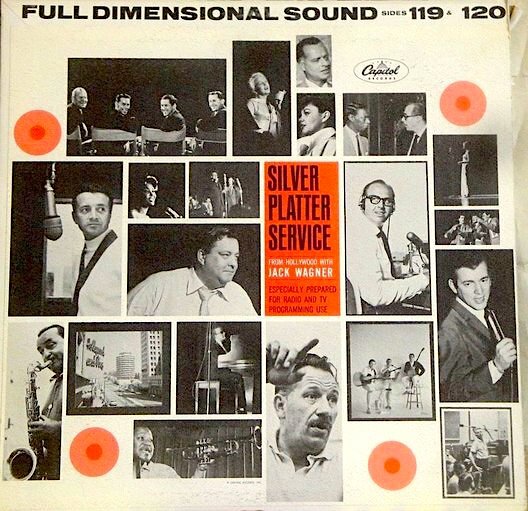 Title: Silver Platter Service, Sides 119 & 120 / Format: LP / Label: Capitol / Cat. Num. : Pro 3119 & Pro 3120 / Rel. Date: September 1964 / Note: Starts off with Peggy Lee's recording of "When In Rome," from her 1964 album In The Name Of Love. Since I have the track listing of the A side only, I do not know if Lee happens to be featured on the B side as well. 15. 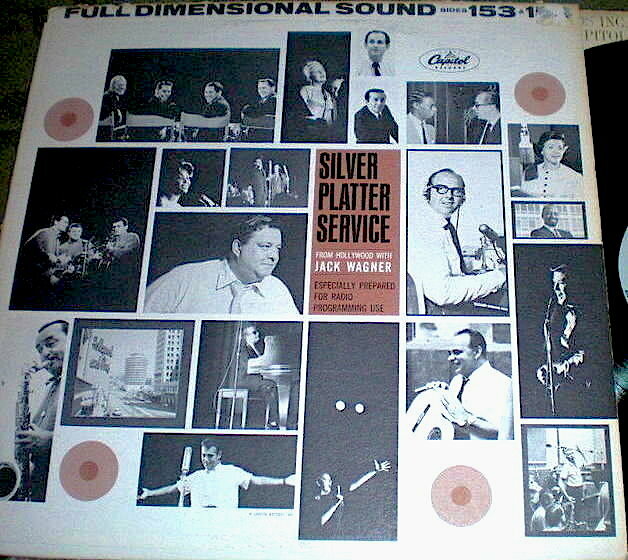 Title: Silver Platter Service, Sides 153 & 154 / Format: LP / Label: Capitol / Cat. Num. : Pro 3153 & Pro 3154 / Rel. Date: 1965, probably May or June / Note: The first side of this promotional album is entitled "Salute To Nat King Cole" and features Cole numbers only, most of them taken from the commercial LP The Nat King Cole Story. The second side opens with Peggy Lee's recording of "L.o.v.e," from her 1965 album Pass Me By. 16. 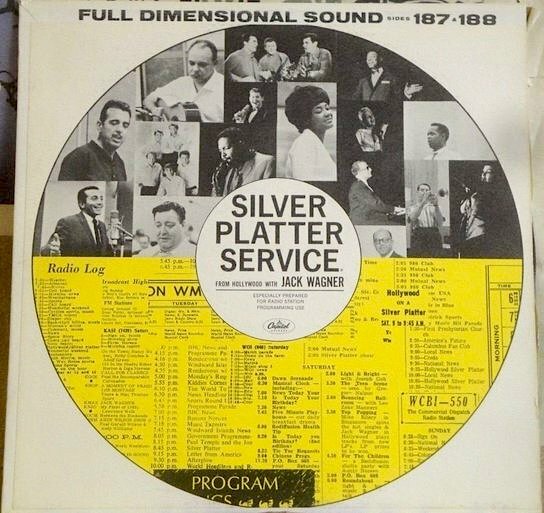 Title: Silver Platter Service, Sides 179 & 180 / Format: LP / Label: Capitol / Cat. Num. : Pro 3179 & Pro 3180 / Rel. Date: December 1965 / Note: This Silver Platter album features three tracks from the album Then Was Then And Now Is Now ("Trapped," "Losers Weepers," "Everybody Has The Right To Be Wrong") and two tracks from the album Happy Holiday (the title track and "Winter Wonderland"). There is also a three-minute interview with Lee; unfortunately (and unlike interviews from earlier years), the exchange between the Silver Platter disc jockey and his guest artist is devoid of any interesting anecdotes and factual details. 17. 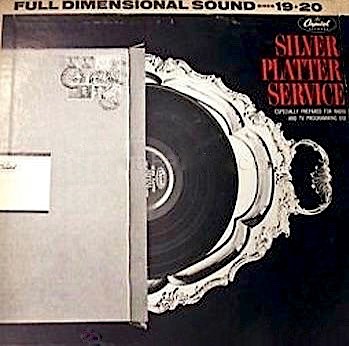 Title: Silver Platter Service, Sides 181 & 182 / Format: LP / Label: Capitol / Cat. Num. : Pro 3181 & Pro 3182 / Rel. Date: January 1966 / Note: This Silver Platter album features at least one Peggy Lee track (perhaps from her album Then Was Then And Now Is Now), but I am missing specifics about it. 18. 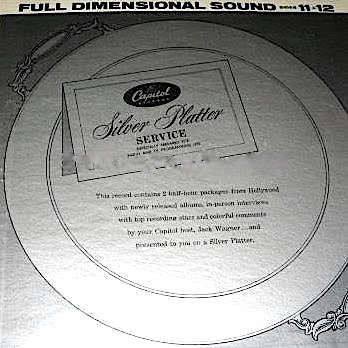 Title: Silver Platter Service, Sides 185 & 186 / Format: LP / Label: Capitol / Cat. Num. : Pro 3185 & Pro 3186 / Rel. Date: January 1966 / Note: Includes Peggy Lee track(s), but I do not know the title(s). 19. 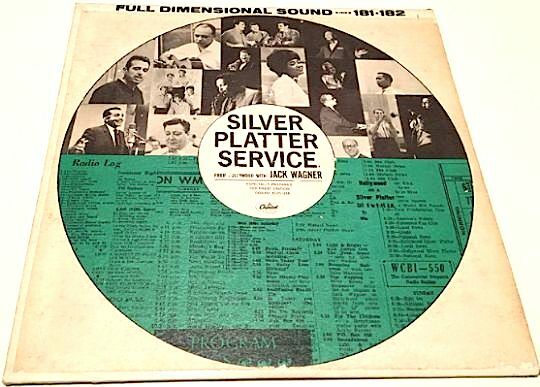 Title: Silver Platter Service, Sides 187 & 188 / Format: LP / Label: Capitol / Cat. Num. : Pro 3187 & Pro 3188 / Rel. Date: February 1966 / Note: Includes Peggy Lee track(s), but I do not know the title(s). 20. 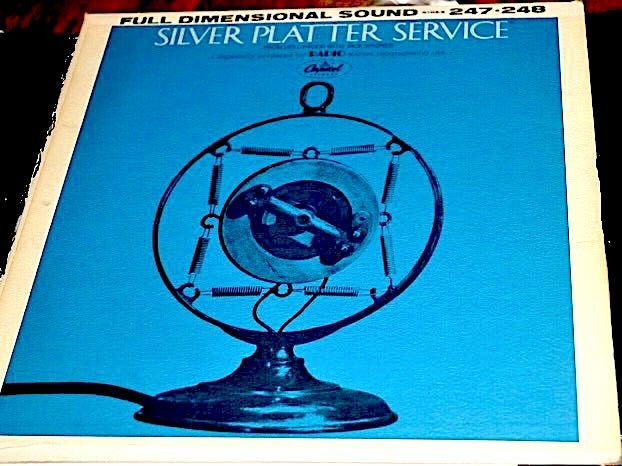 Title: Silver Platter Service, Sides 197 & 198 / Format: LP / Label: Capitol / Cat. Num. : Pro 3197 & Pro 3198 / Rel. Date: May 1966 / Note: This Silver Platter album features two vocals from Peggy Lee's album Big $pender, "Gotta Travel On" and "Watch What Happens." The album also includes brief talking segments with Lee. 21. 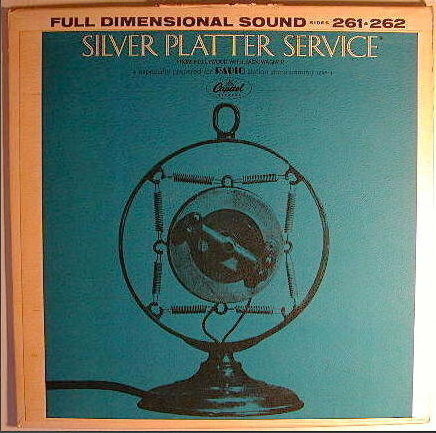 Title: Silver Platter Service, Sides 221 & 222 / Format: LP / Label: Capitol / Cat. Num. : Pro 3221 & Pro 3222 / Rel. Date: November 1966 / Note: This Silver Platter album features two vocals from Peggy Lee's album Guitars Ala Lee, "Think Beautiful" and "Call Me." 22. 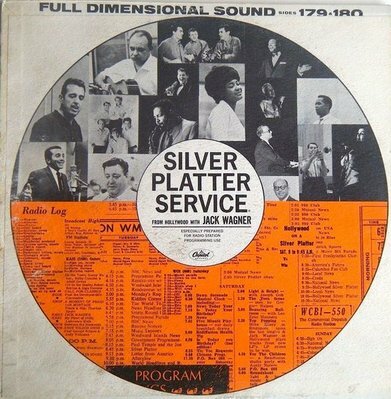 Title: Silver Platter Service, Sides 223 & 224 / Format: LP / Label: Capitol / Cat. Num. : Pro 3223 & Pro 3224 / Rel. Date: November 1966 / Note: This Silver Platter album features two vocals from Peggy Lee's album Guitars Ala Lee, "Strangers In The Night" and "Sweet Happy Life." 23. Title: Silver Platter Service, Sides 225 & 226 / Format: LP / Label: Capitol / Cat. Num. : Pro 3225 & Pro 3226 / Rel. Date: December 1966 / Note: This Silver Platter album features two vocals from Peggy Lee's album Guitars Ala Lee, "Touch The Earth" and "Mohair Sam." 24. 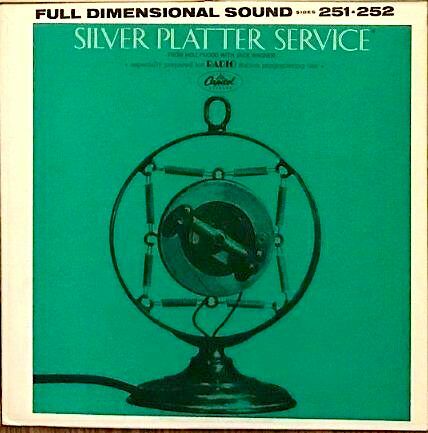 Title: Silver Platter Service, Sides 243 & 244 / Format: LP / Label: Capitol / Cat. Num. : Pro 3243 & Pro 3244 / Rel. Date: April 1967 / Note: Includes Peggy Lee recordings of "Hey, Look Me Over" and "When He Makes Music," both of which were included in her anthological LP Extra Special!. 25. 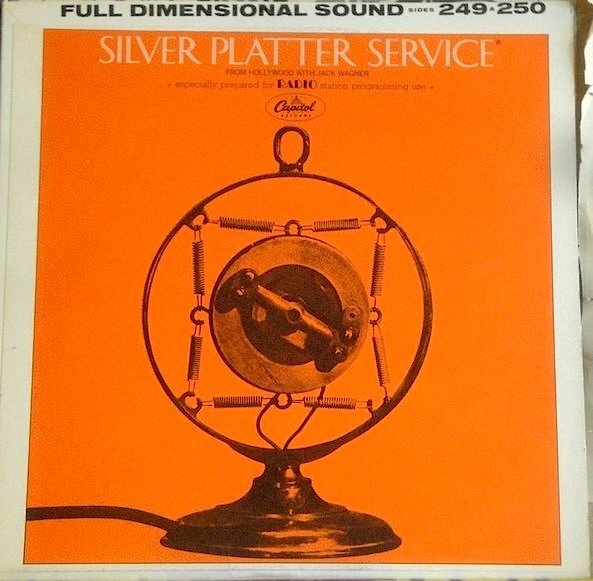 Title: Silver Platter Service, Sides 245 & 246 / Format: LP / Label: Capitol / Cat. Num. : Pro 3245 & Pro 3246 / Rel. Date: May 1967 / Note: Contains the tracks taken from the Peggy Lee LP anthology Extra Special!, "Oh, You Crazy Moon," and "A Bucket Of Tears." 26. 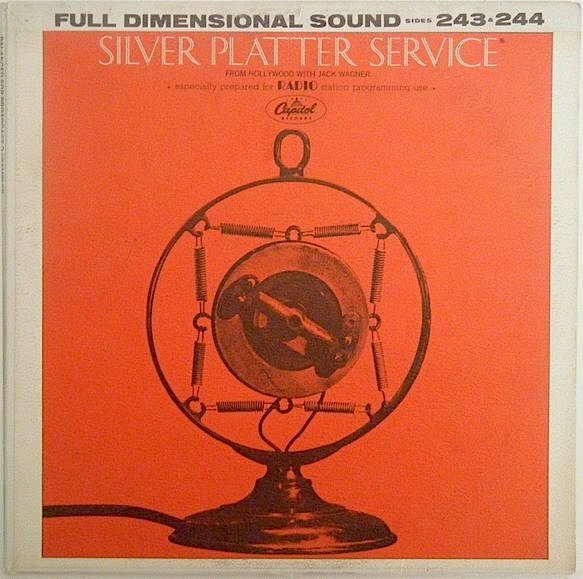 Title: Silver Platter Service, Sides 247 & 248 / Format: LP / Label: Capitol / Cat. Num. : Pro 3247 & Pro 3248 / Rel. Date: May & June 1967 / Note: Contains a brief interview with Peggy Lee as well as the tracks "So What's New," "The Shining Sea," and "A Doodlin' Song", all of them from her compilation Extra Special!. 27. 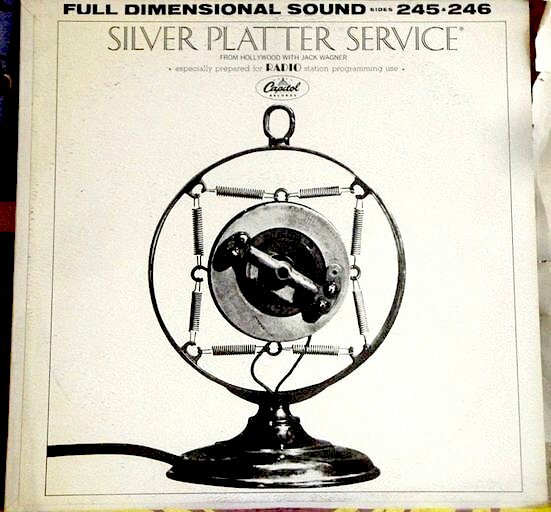 Title: Silver Platter Service, Sides 249 & 250 / Format: LP / Label: Capitol / Cat. Num. : Pro 3249 & Pro 3250 / Rel. Date: May 1967 / Note: Includes Peggy Lee recording of "Walking Happy," taken from her anthological album Extra Special!. 28. 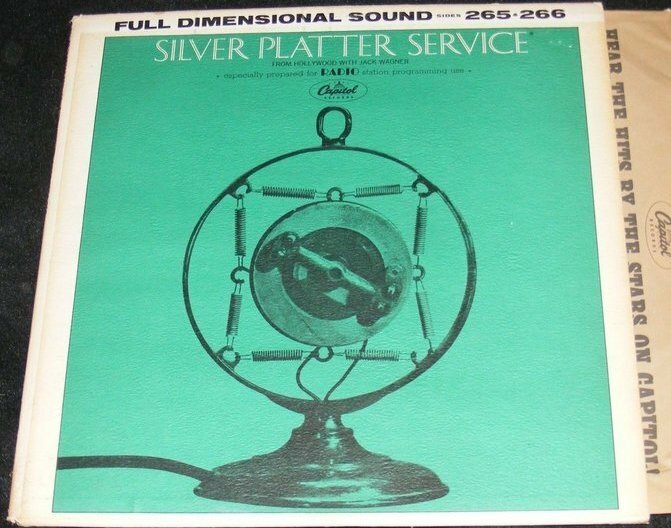 Title: Silver Platter Service, Sides 251 & 252 / Format: LP / Label: Capitol / Cat. Num. : Pro 3251 & Pro 3252 / Rel. Date: June 1967 / Note: This Silver Platter album features one or more vocals by Peggy Lee, probably from her album Extra Special!. I do not count with any further specifics. 29. 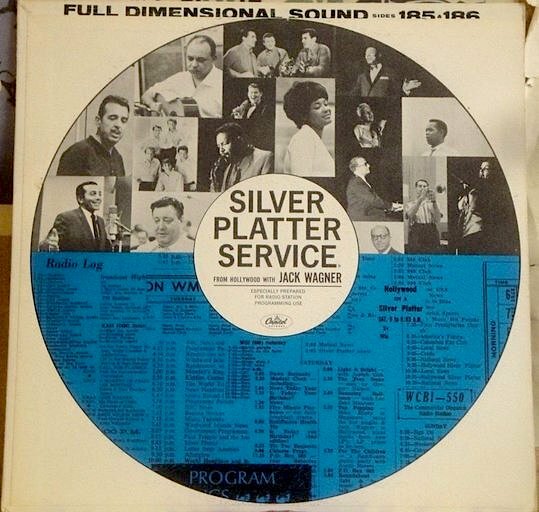 Title: Silver Platter Service, Sides 261 & 262 / Format: LP / Label: Capitol / Cat. Num. : Pro 3261 & Pro 3262 / Rel. Date: August 1967 / Note: Contains the numbers "Somethin' Stupid," "Makin' Whoopee," and "Love Is Here To Stay," all three from her album Somethin' Groovy. One of the album's key players, Toots Thielemans, is interviewed before two of the songs are played. 30. Title: Silver Platter Service, Sides 265 & 266 / Format: LP / Label: Capitol / Cat. Num. : Pro 3265 & Pro 3266 / Rel. 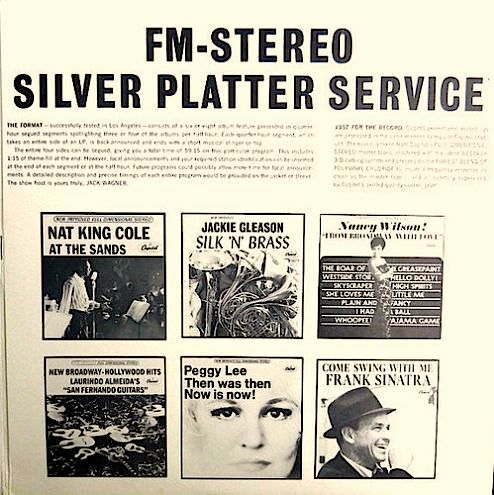 Date: September 1967 / Note: taken from the Peggy Lee album Somethin' Stupid, her interpretations of "I'm Gonna Get It" and "No Fool Like An Old Fool" are included in this Silver Platter release, which is presumed to be among the last few in the series. 31. 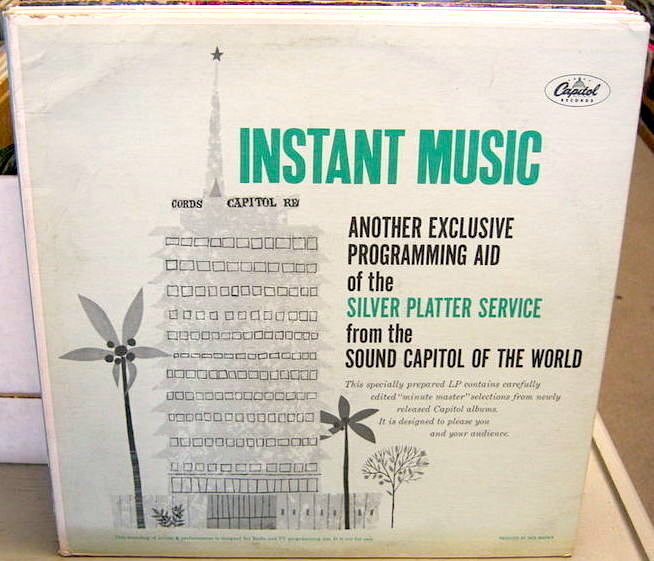 Title: Instant Music ("Silver Platter"/"Minute Masters" Series) / Format: LP / Label: Capitol / Cat. Num. : Pro 2430 & Pro 2431 / Rel. Date: September 1963 / Note: All numbers are edited down to around one minute. The front cover includes the legend "another exclusive programming aid of the Silver Platter Service from the Sound Capitol Of The World." Side 1 contains only vocals, side B just instrumentals. The vocals are by The Lettermen, Nancy Wilson, Bobby Darin, The Kinston Trio, Peggy Lee, The Lettermen, Frank Sinatra, and one additional group. Peggy Lee's vocal is "It's A Big, Wide, Wonderful World," from her album Mink Jazz. 32-33. 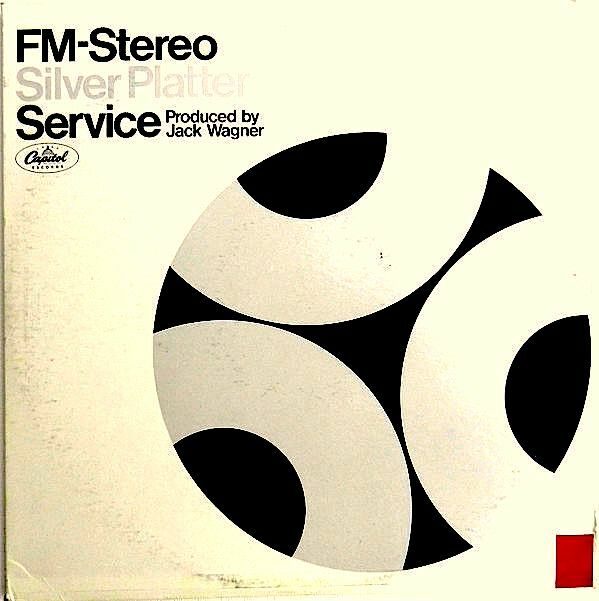 Title: FM Stereo Silver Platter Service ("Silver Platter"/"Minute Masters" Series) / Format: LP / Discs: 2 / Label: Capitol / Cat. Num. : Pro 4111 & Pro 4112 & Pro 4113 & Pro 4114 / Rel. Date: June 1966 / Note: Along with the album cover and the two vinyl discs inside, this release also contains promotional material. A letter addressed to "FM-stereo broadcasters" informed them about the experimental nature of the album, with which Capitol was intending to inaugurate a stereo branch of its Silver Platter service. (All preceding albums in the series had been monaural items.) To measure the program's potential, a questionnaire meant for the FM stations' managers was included, too. In the album'a back cover, program director Jack Wagner points out that the featured tracks had been "mastered with the latest Westrex 3-D cutting system and pressed on the purest blend of polyvinyl chloride to insure a frequency response clear as clean as the master tape." 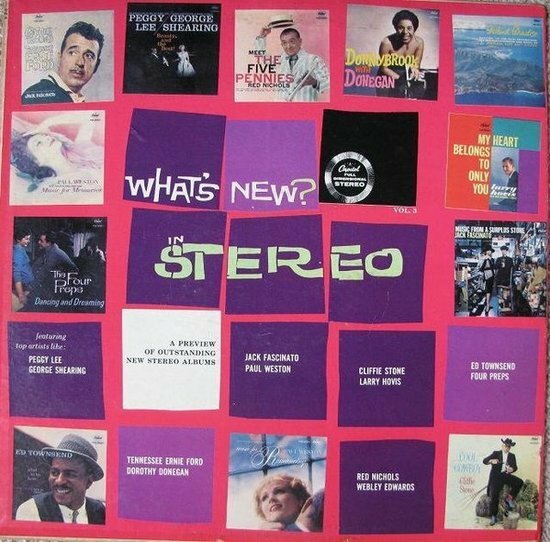 Capitol albums by six particular artists were sampled on this 2LP set: Laurindo Almeida, Nat King Cole, Jackie Gleason, Peggy Lee, Frank Sinatra, and Nancy Wilson. 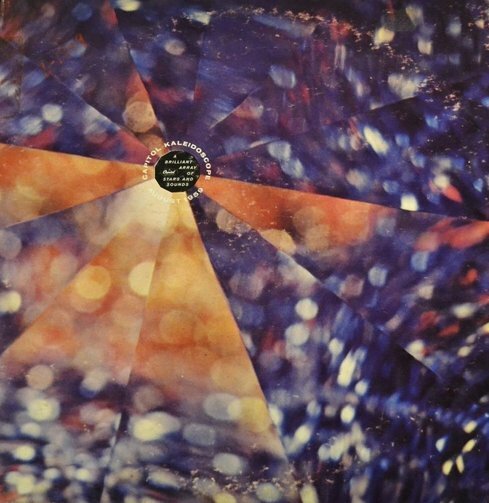 The front covers of the sampled albums are reproduced in the back of the Silver Platter release, pictured last above. From the Peggy Lee LP Then Was Then, Now Is Now!, three tracks were picked: "The Masquerade Is Over," "Ev'rybody Has The Right To Be Wrong," and "Losers Weepers." 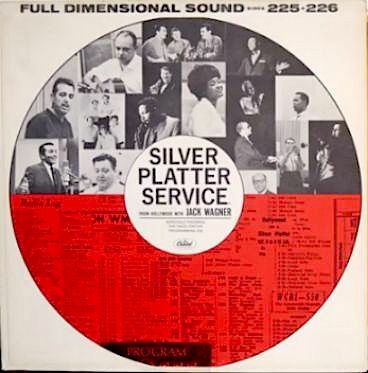 General Note About The "Silver Platter Service"
The Silver Platter Service appears to have been one of the earliest concepts that Wagner presented to Lloyd W. Dunn and Fred Rice, two of the company's leading publicity and marketing VP's. The idea was well-received, and quickly green lighted. Wagner was also the creative and/or implementing mind behind most of the other promotional album series showcased on this page, including Minute Masters and Balanced For Broadcast. 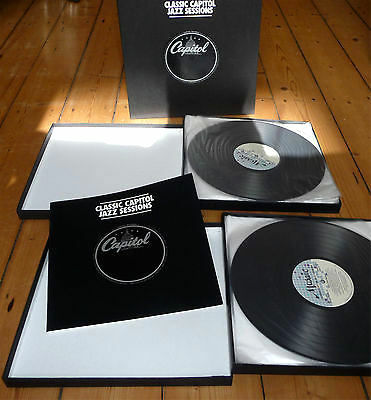 Each Silver Platter LP combined selections from recently released Capitol albums with pre-recorded interviews of the label's artists. The selections were transferred directly from the master tapes, and equalized by Wagner himself. One additional feature was pre-recorded chatter with a disc jockey from one of the subscribing stations, and the rewarding of one faithful listener (sometimes interviewed as well, via phone) with a Capitol LP. The discs were exclusively sent to one AM radio station per market. Capitol targeted those which played pop-oriented material, rather than rock, country, or rhythm & blues tunes. Top participating stations and networks included WNEW in New York City, KLAC in Los Angeles, WIP in Philadelphia, the Armer Forces Radio, Voice Of America, and Radio Free Europe. Each individual station was expected to air the given LP upon receipt, (with the option of doing so repeatedly, if so inclined, throughout a six-month period. A new LP was sent out every two weeks. The programs clocked in at 24 minutes (12 minutes per side) and provided five slots for the stations' commercials. Discs did not have to be returned and -- the most alluring feature -- subscription was entirely free of charge. By 1966, Capitol was boasting that the Service counted with 1,400 subscribing radio stations -- 1,000 of them located in the US, 400 overseas. 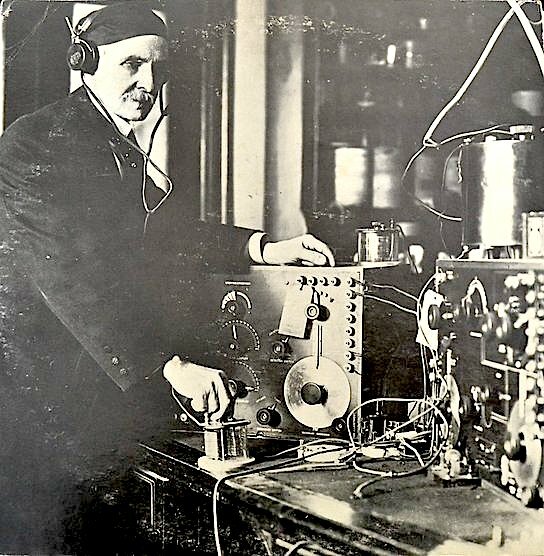 It was around that time, following five years of success in the AM channels, that Wagner and company made an attempt at launch into FM stations. The attempt generated at least one LP (discussed in one of the last entries above), but does not seem to have proceeded much further. Being the program's director, and having actually come up with the concept, Jack Wagner served as Capitol's Silver Platter announcer for most of the service's duration. In mid-1966, he made the decision to return to KHJ as general manager. His position at Capitol was taken by Al Davis -- at least nominally. Despite having formally resigned from his post at the label, Wagner was still "retained by Capitol as an independent supplier" (in the wording used by a trade article from the period). It was not until the decade's near closure that he fully moved on. The man -- brother of choral director Roger Wagner, incidentally -- took up residence at KNX in 1968 and at Disney in 1970. From that year until 1993, he grew to become a celebrated announcer at Disneyland Park. Those Disneyland years thus became the apex of his lengthy career in the media. a AFRTS transcription of Silver Platter in which Wagner interviews Peggy Lee (November 1967, number 162; its contents may be from preceding years). There are probably even more Silver Platter albums with Lee tracks that have not been listed above, simply because they are currently unknown to me. As for those listed, I would appreciate receiving any missing information from fellow listeners.